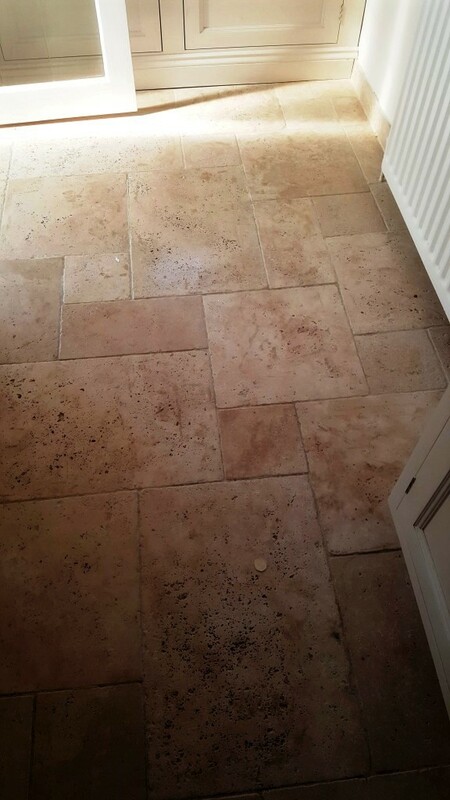 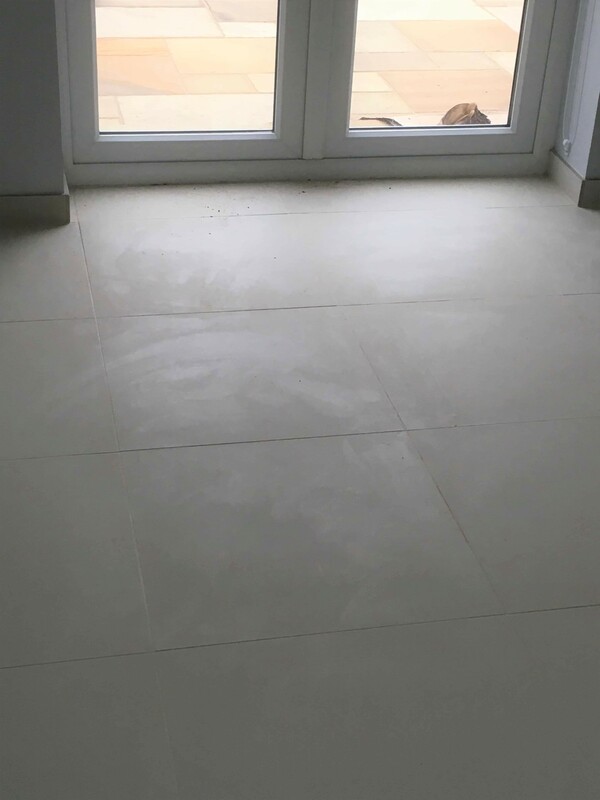 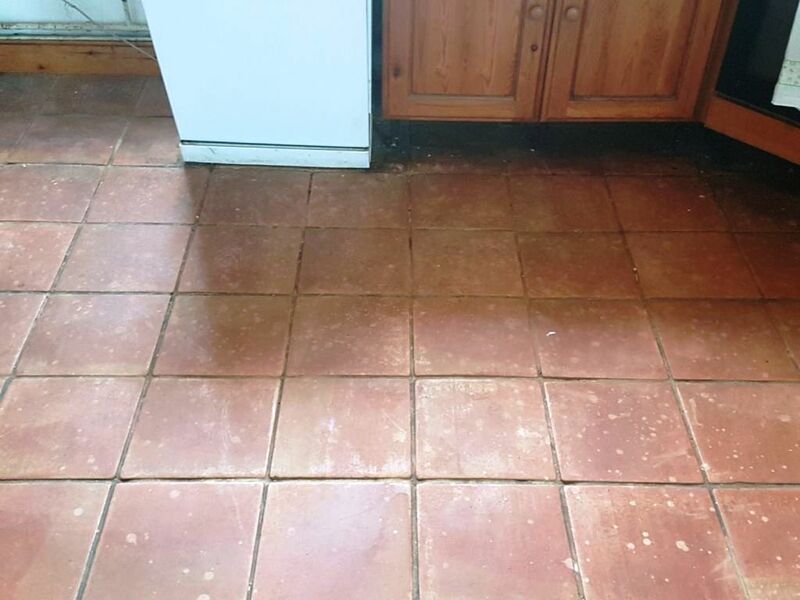 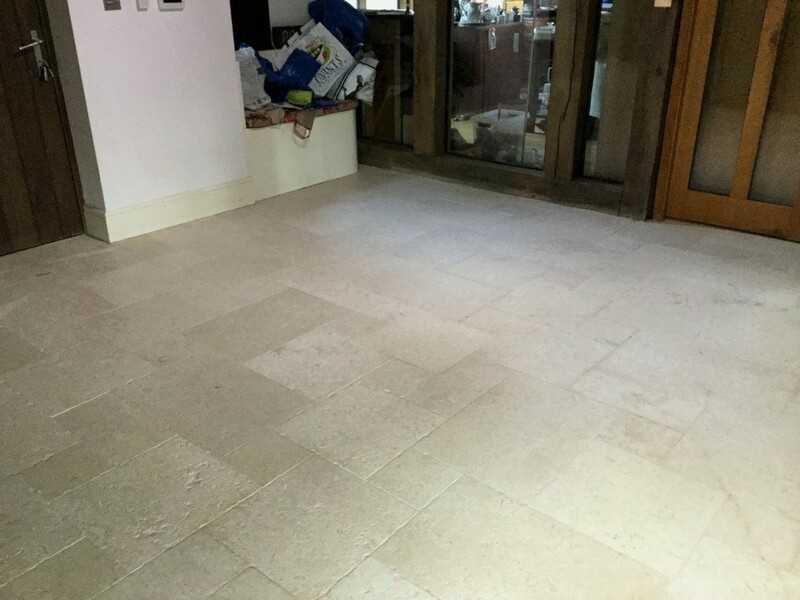 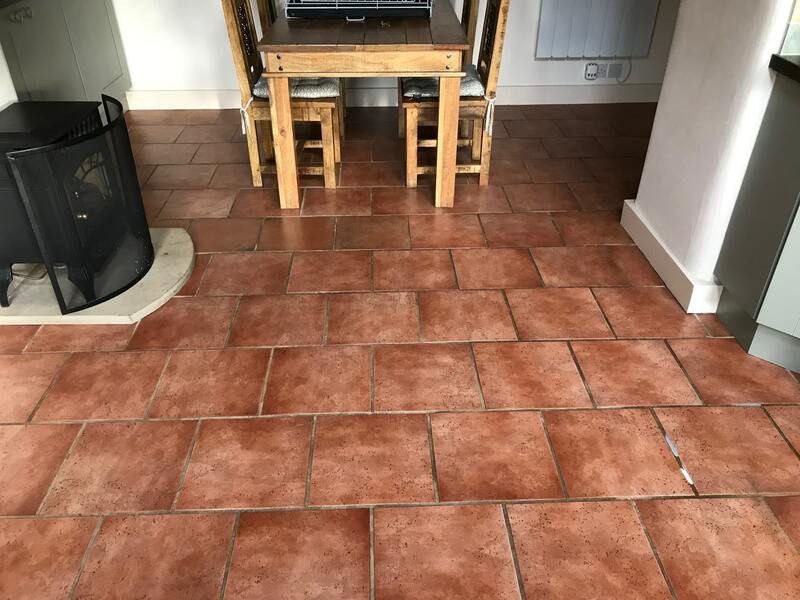 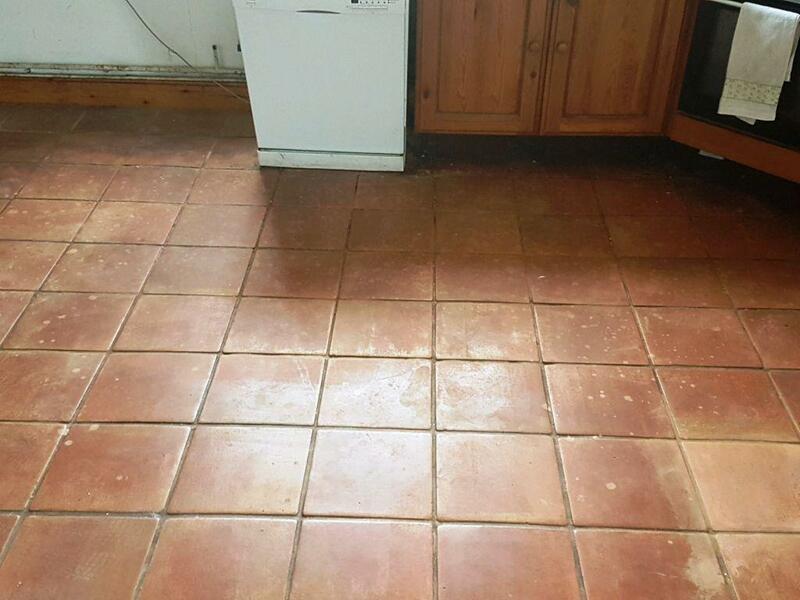 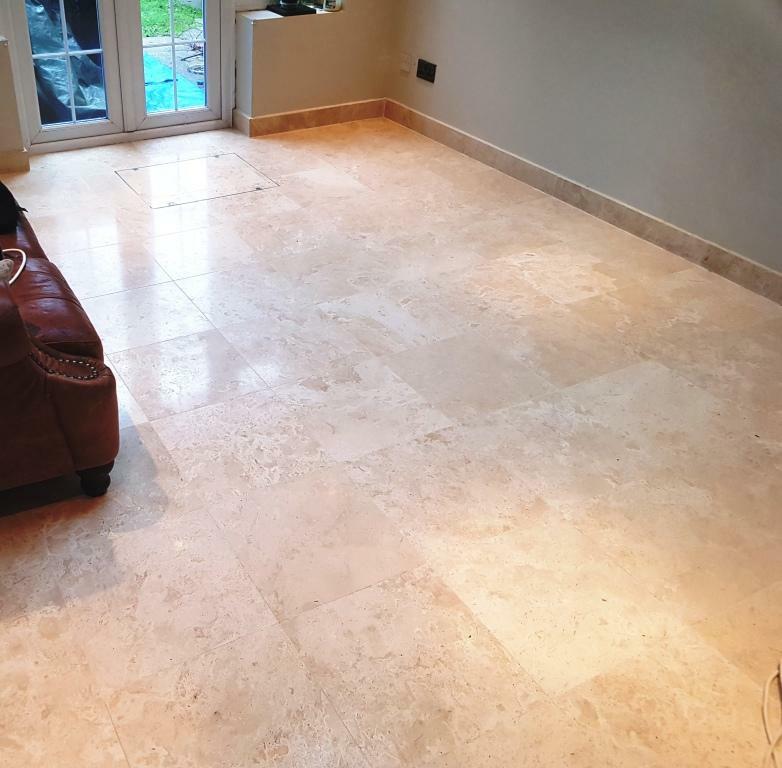 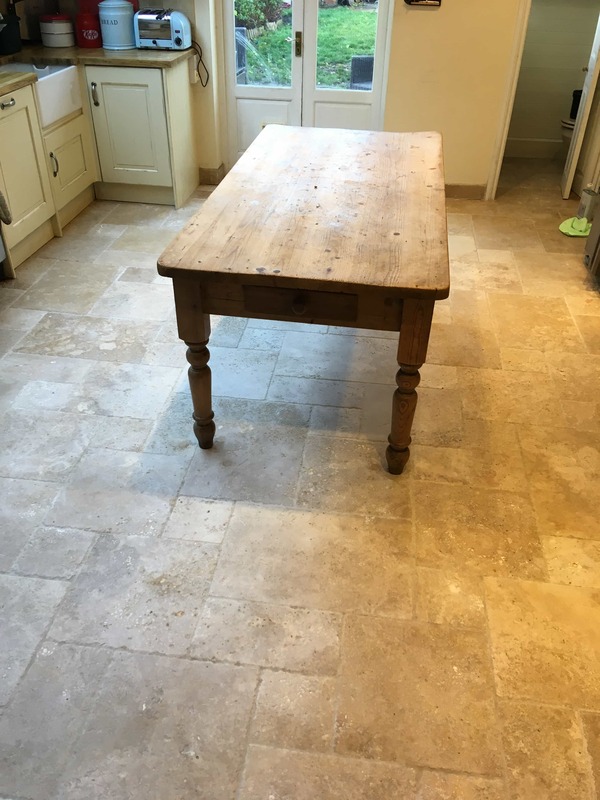 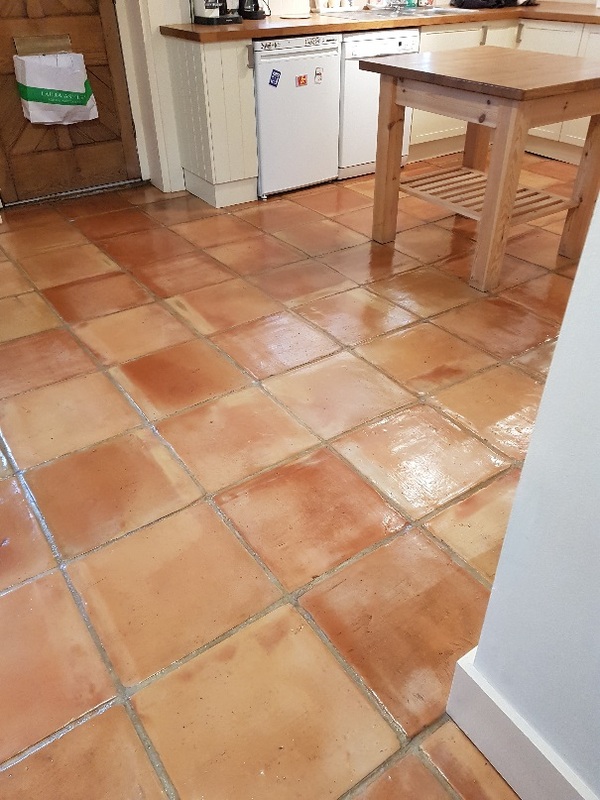 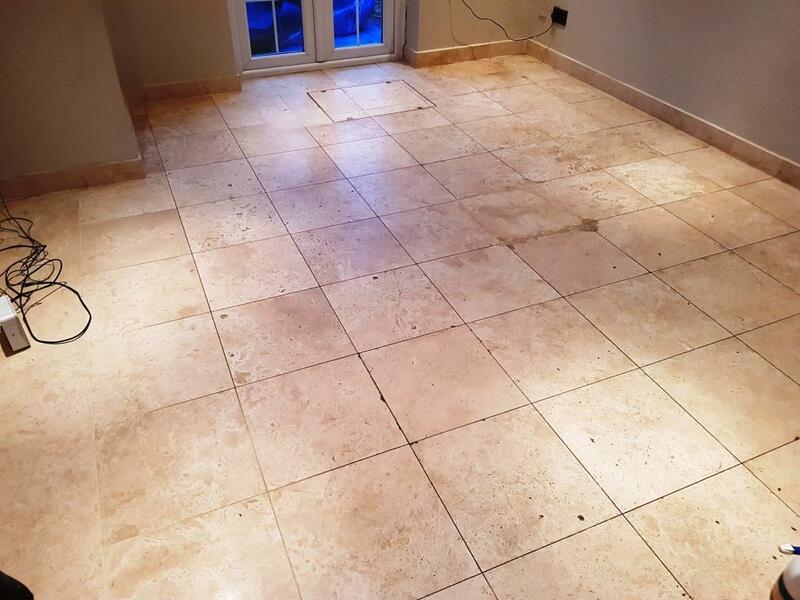 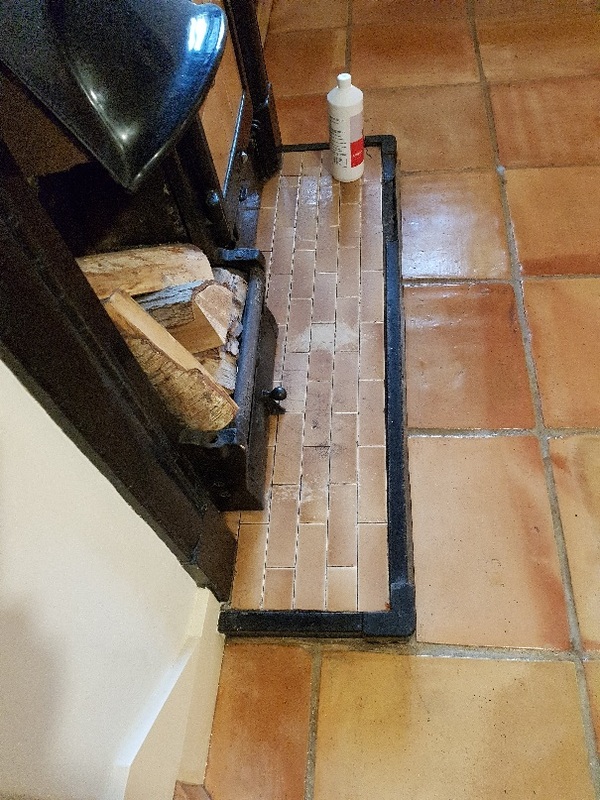 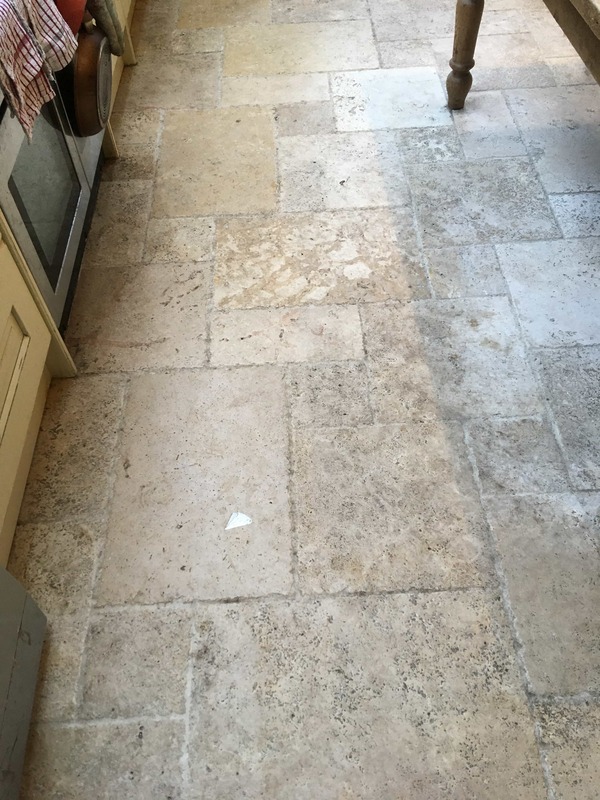 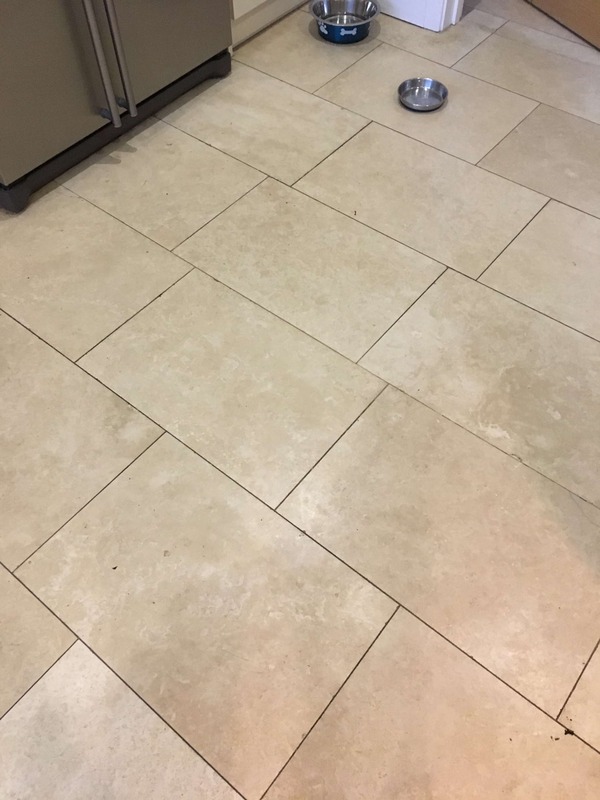 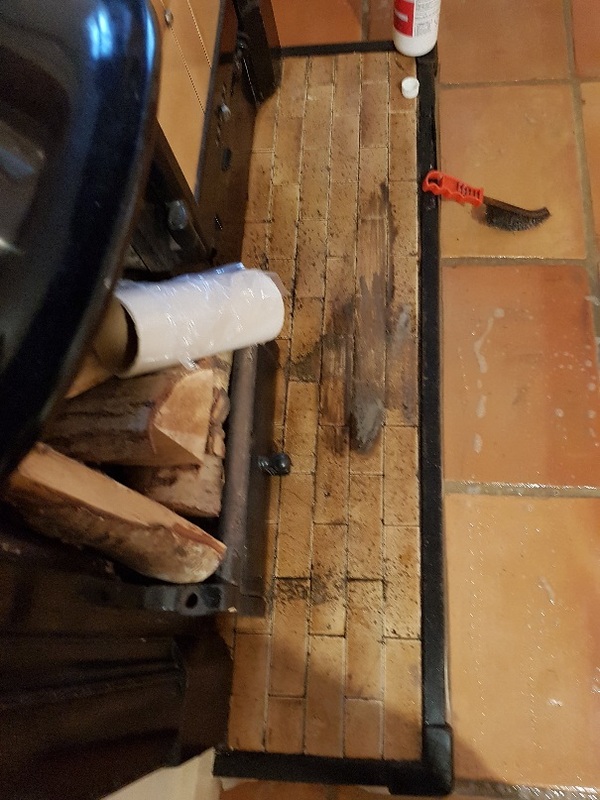 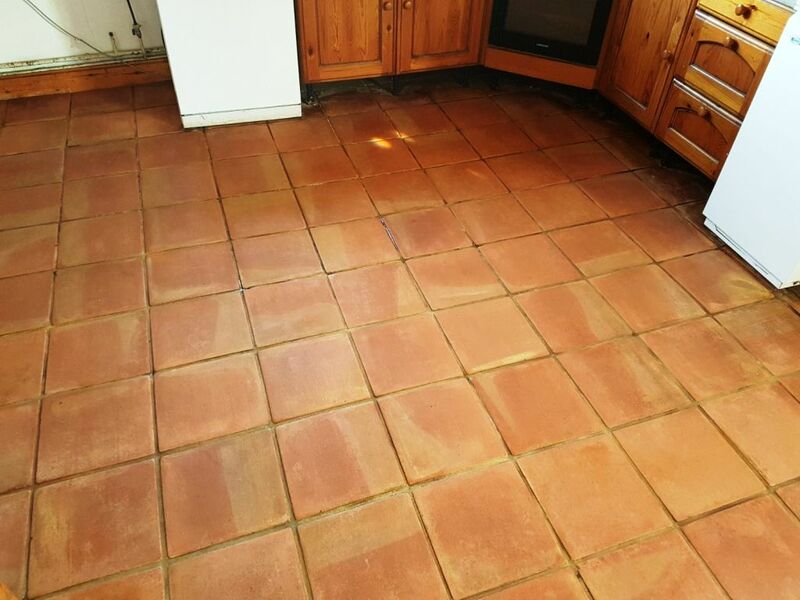 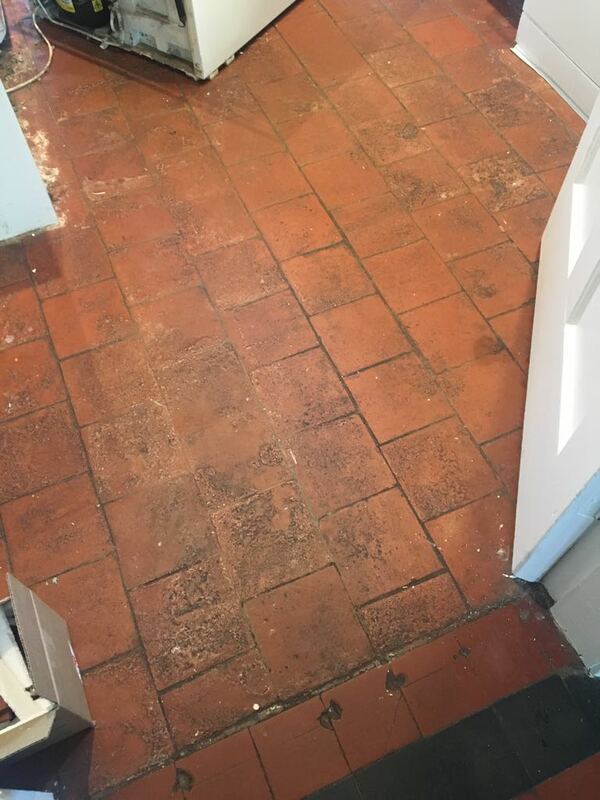 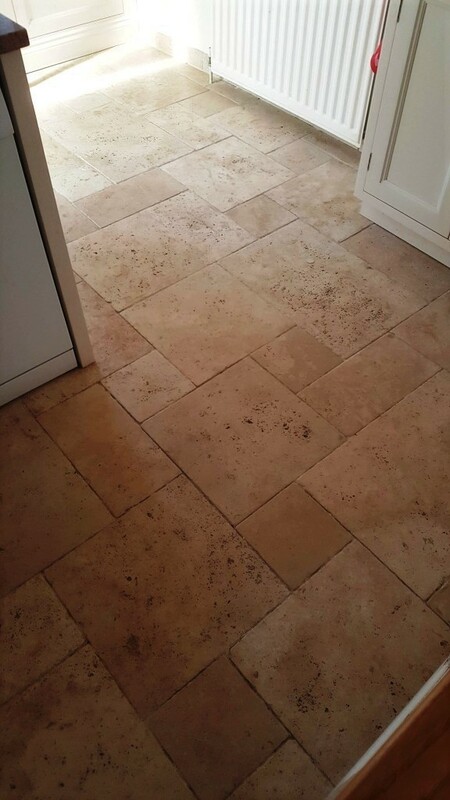 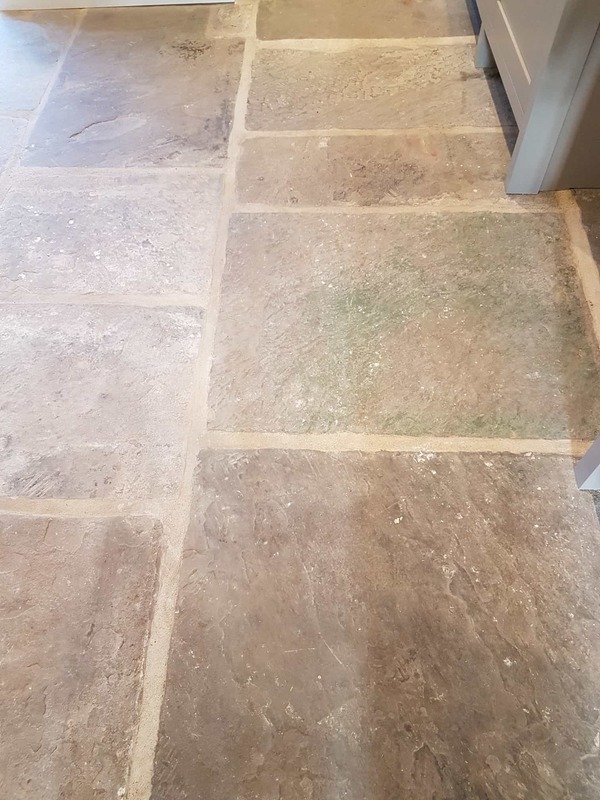 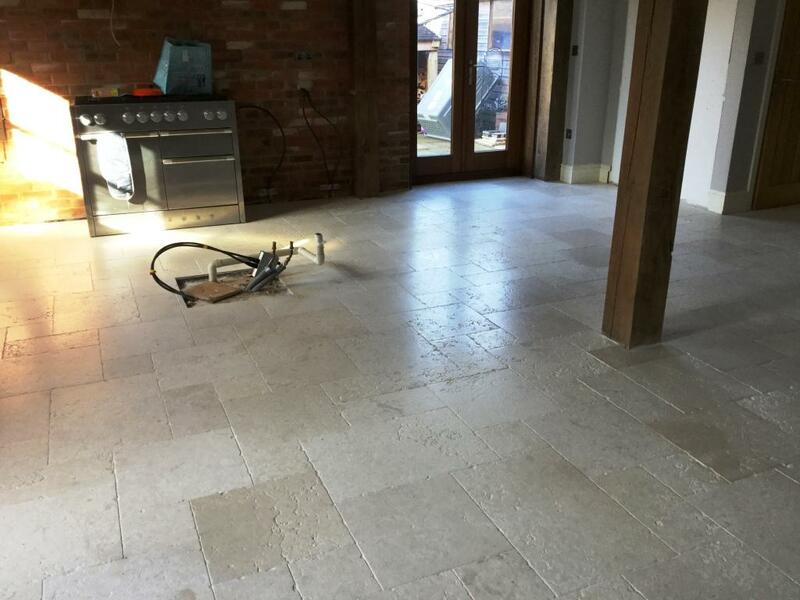 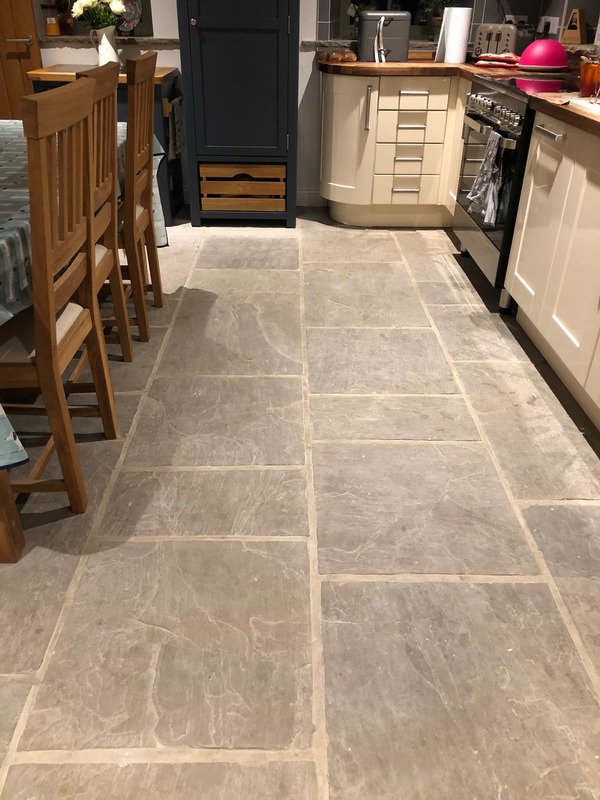 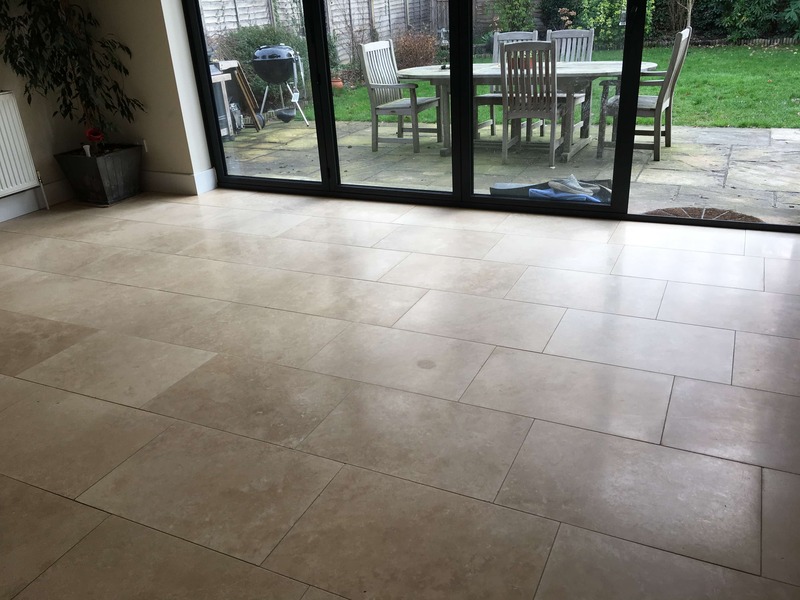 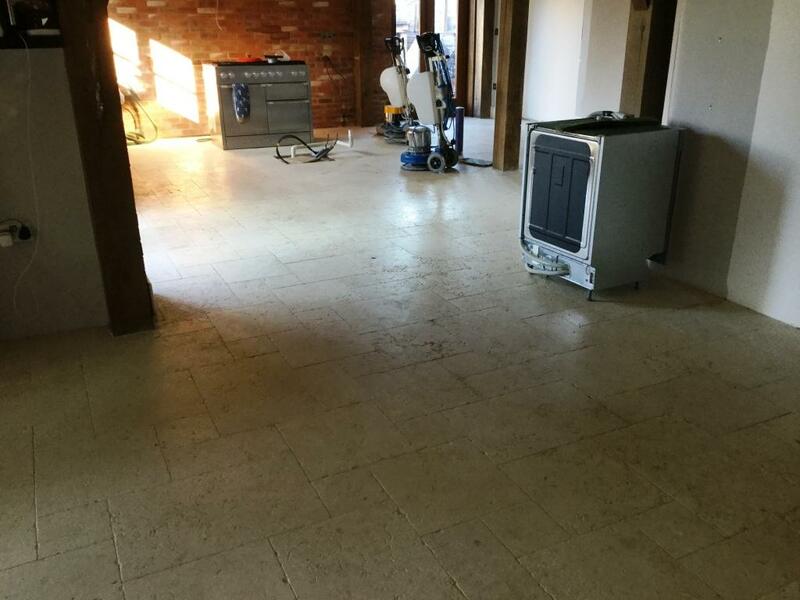 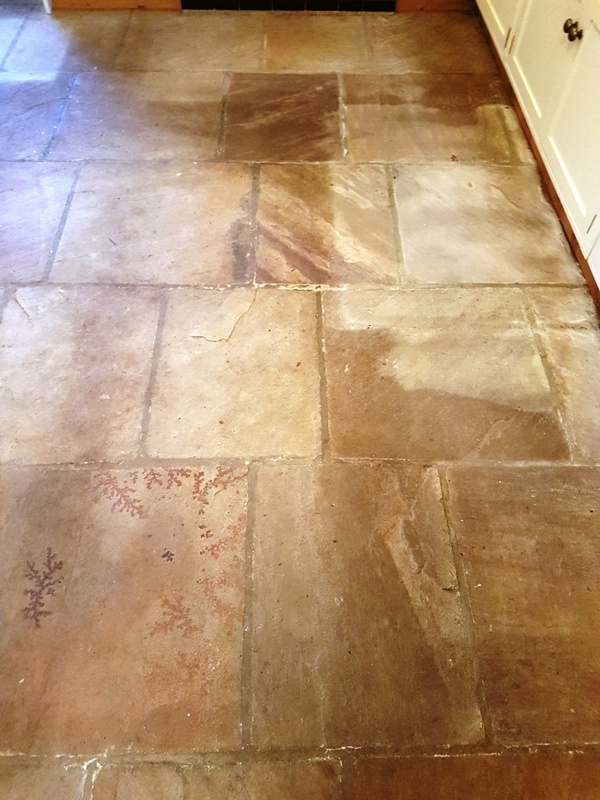 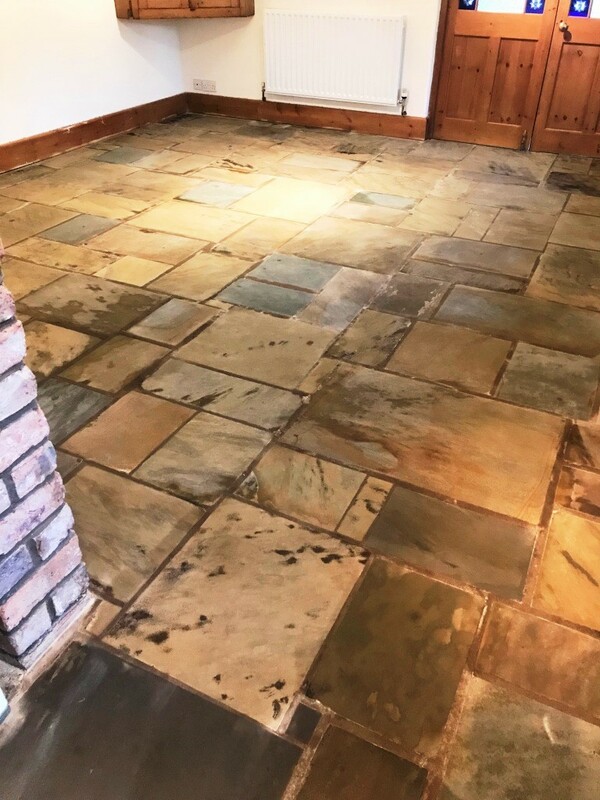 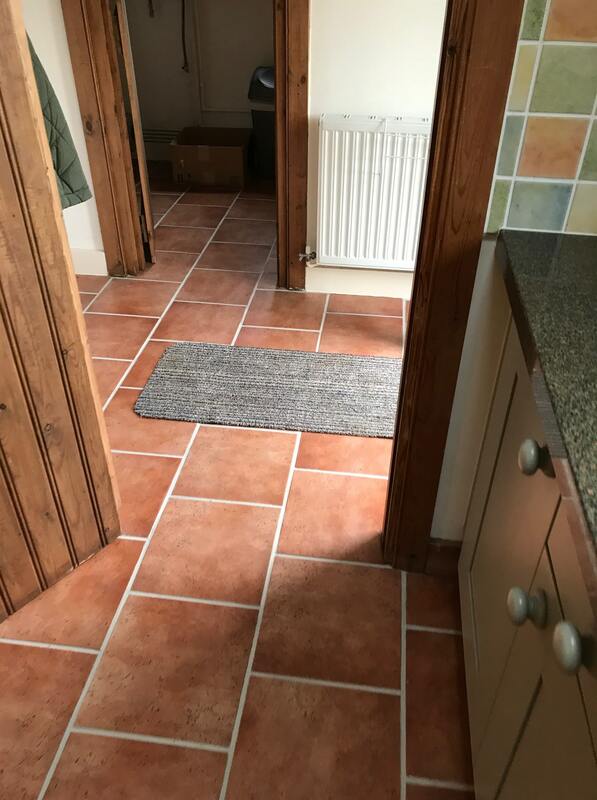 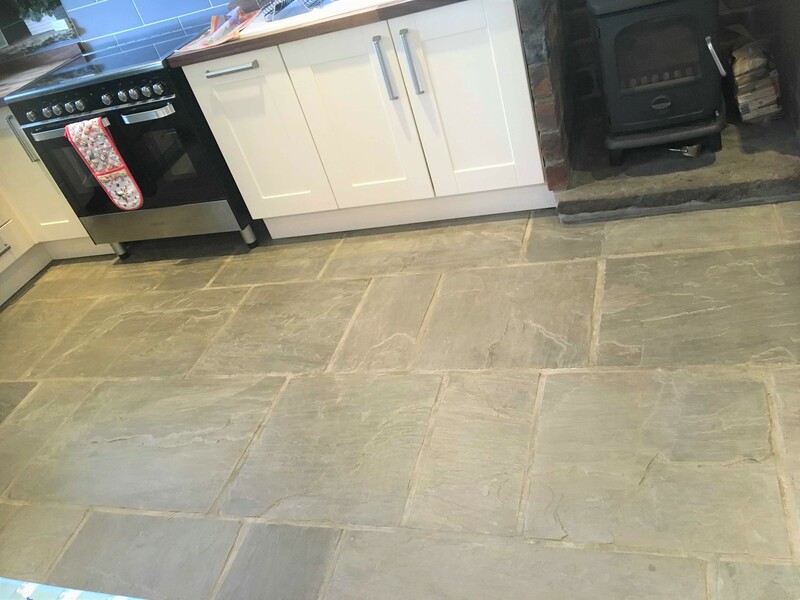 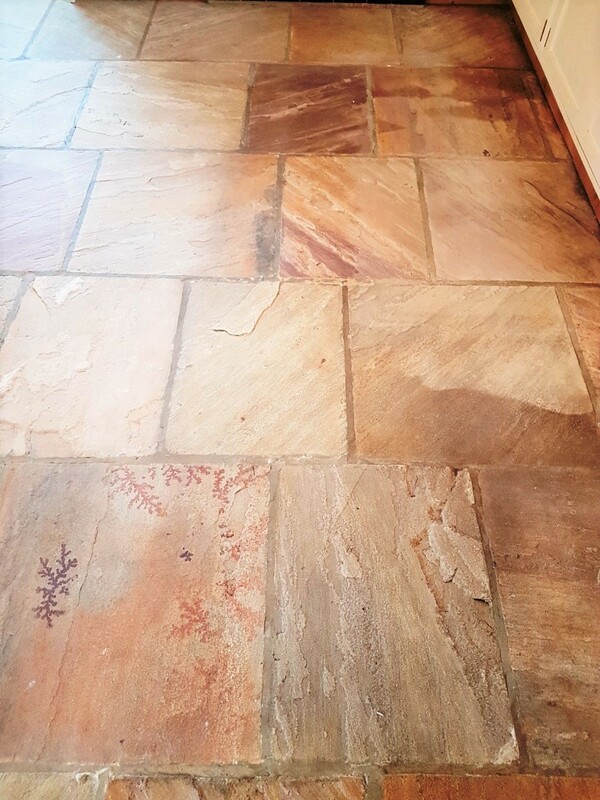 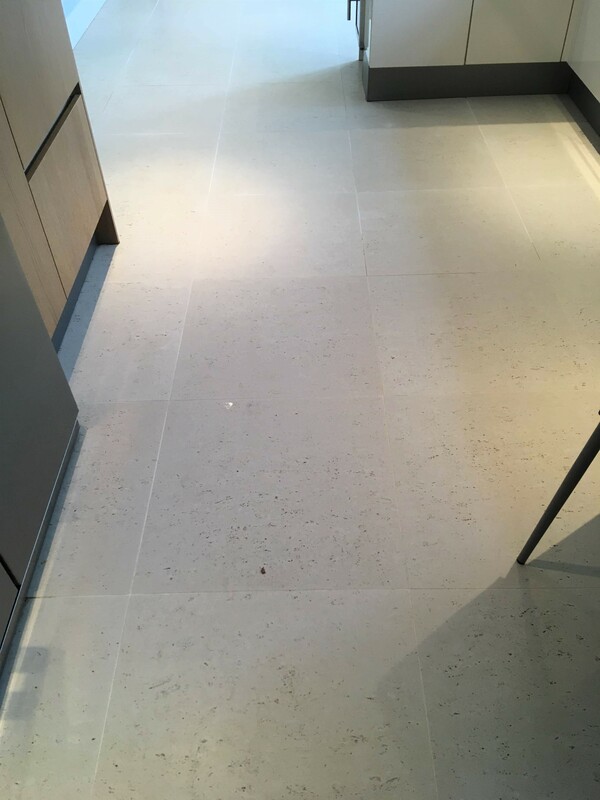 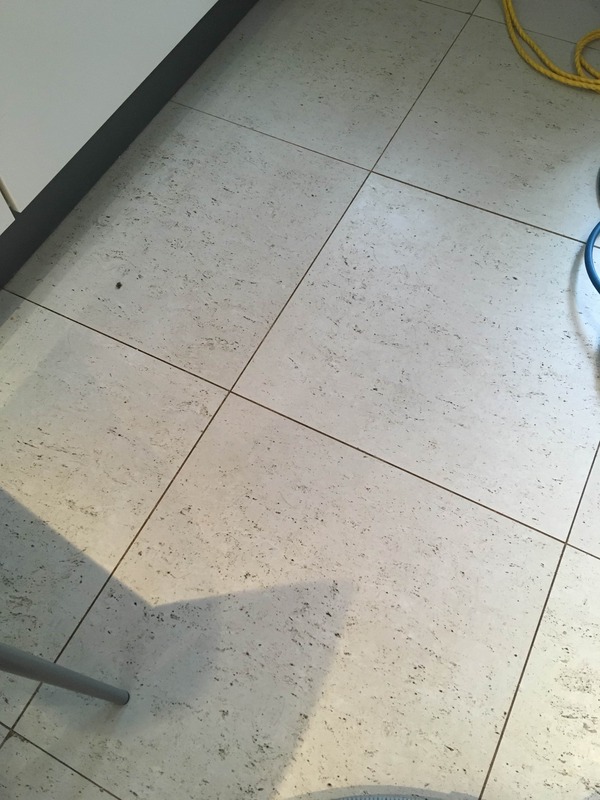 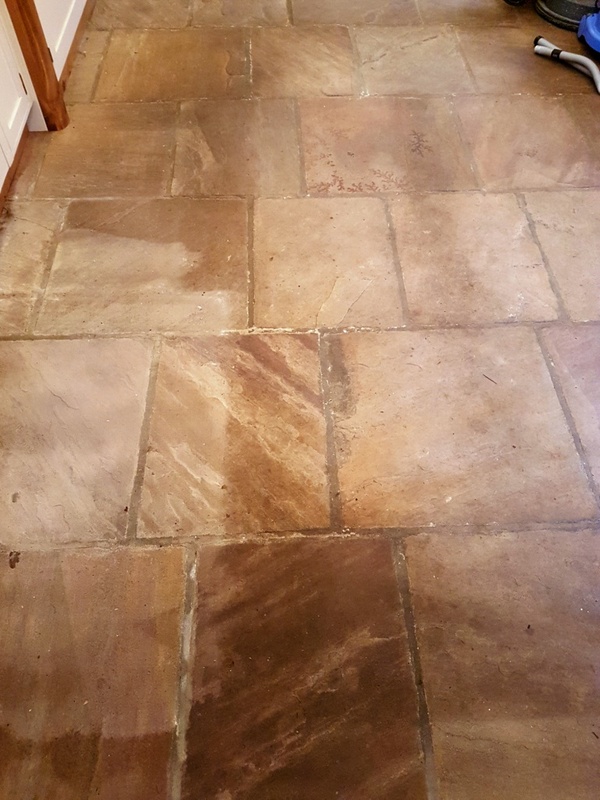 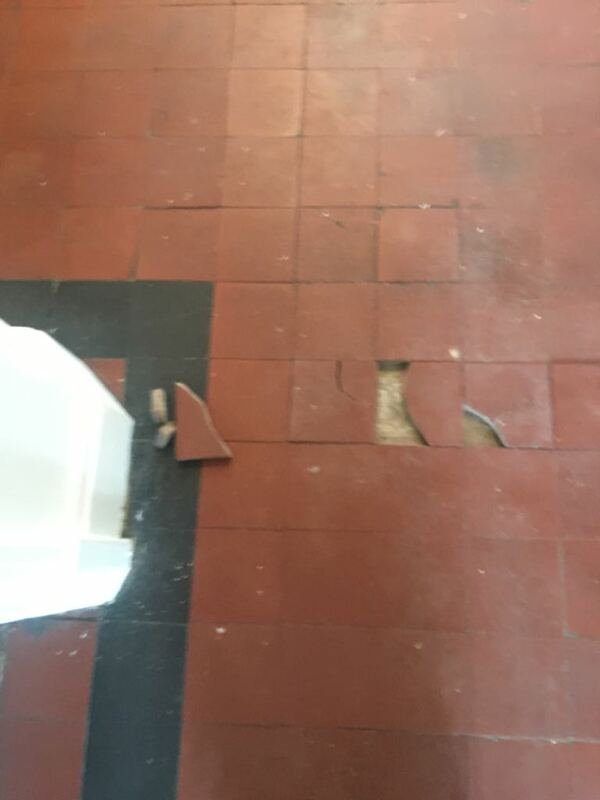 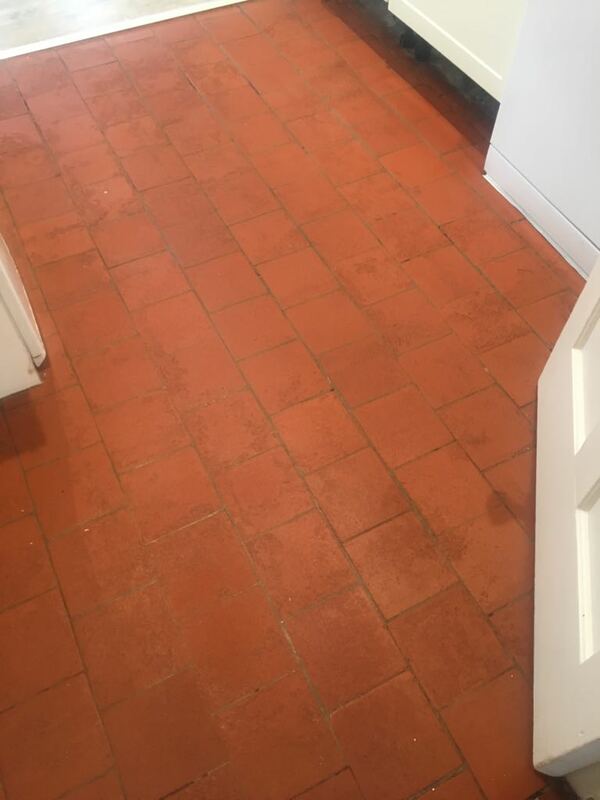 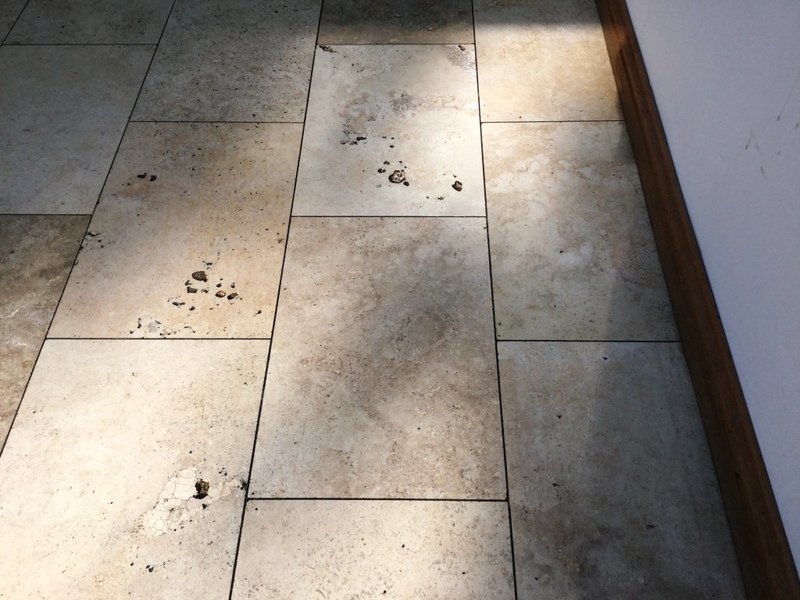 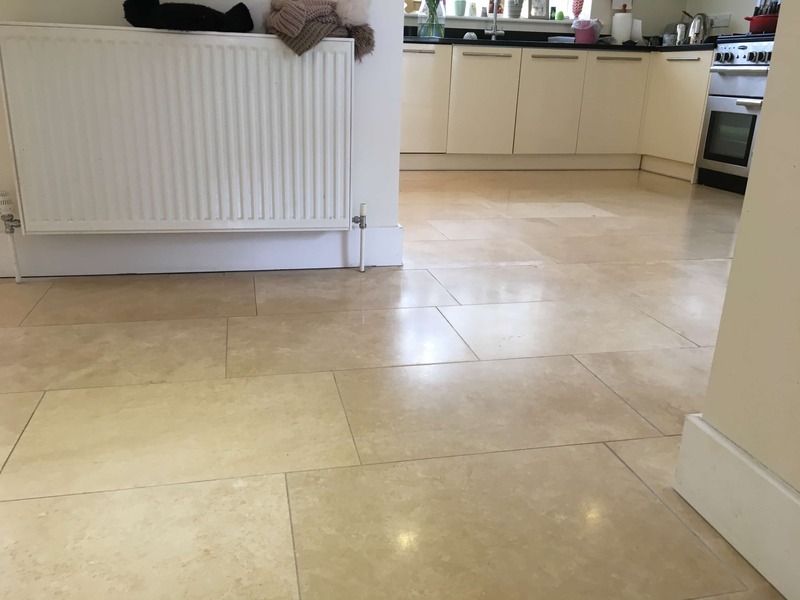 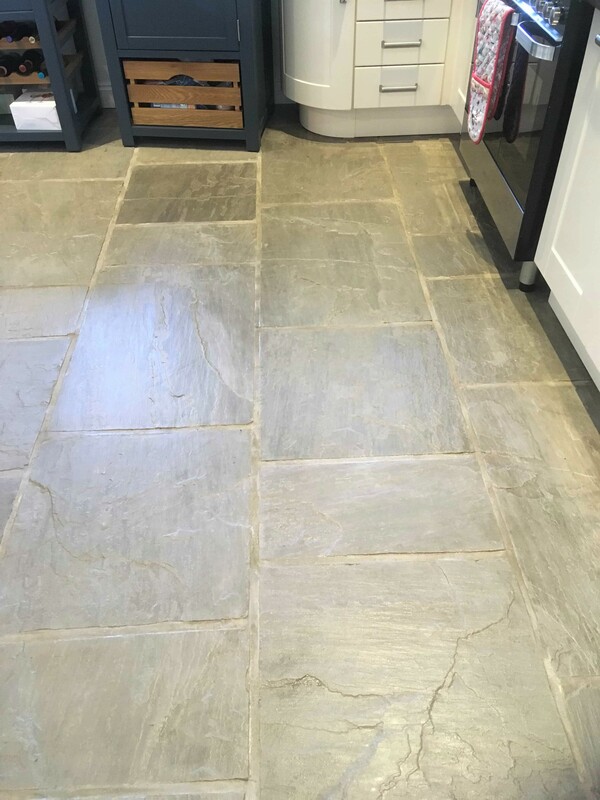 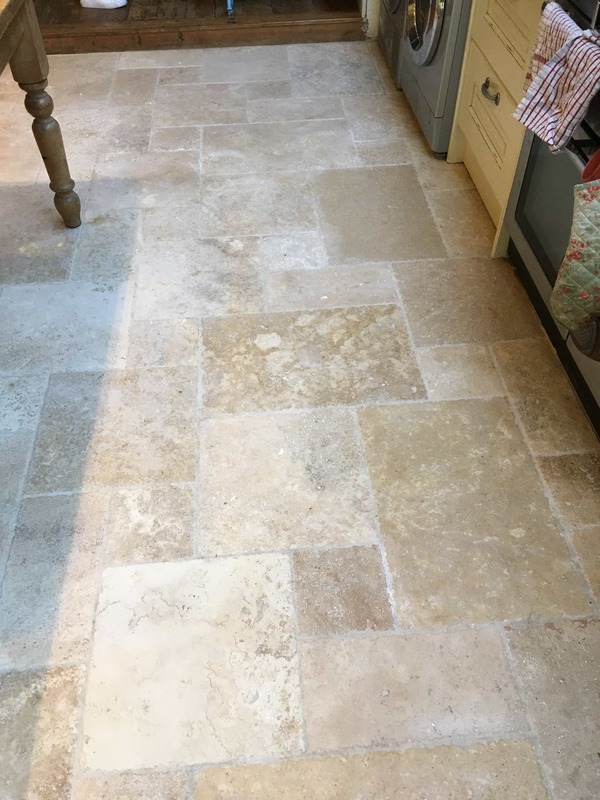 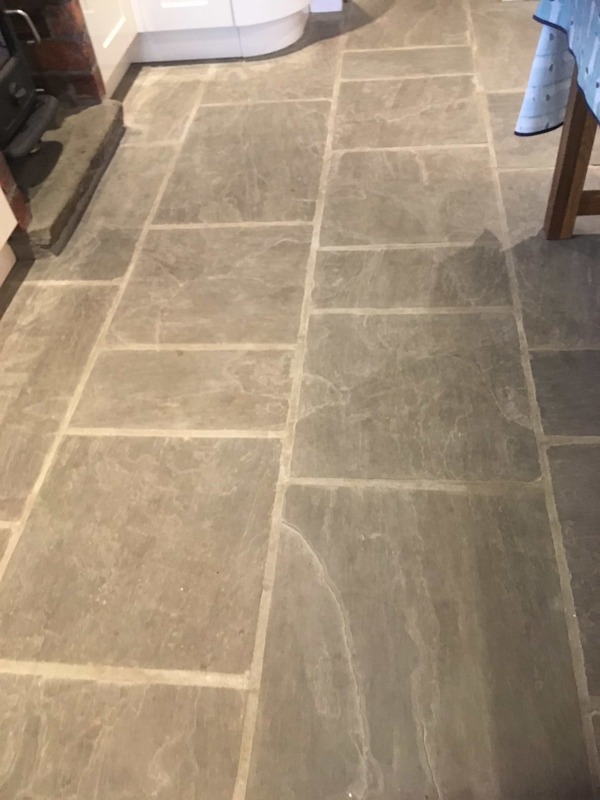 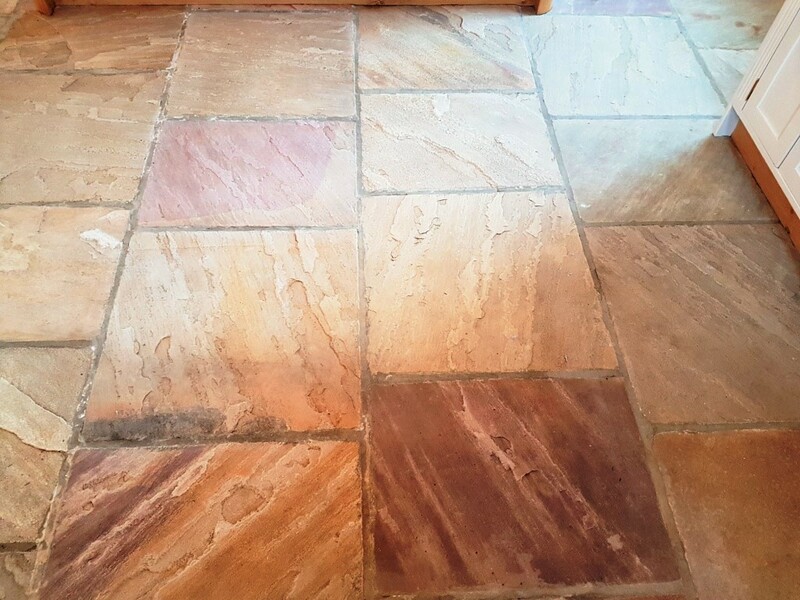 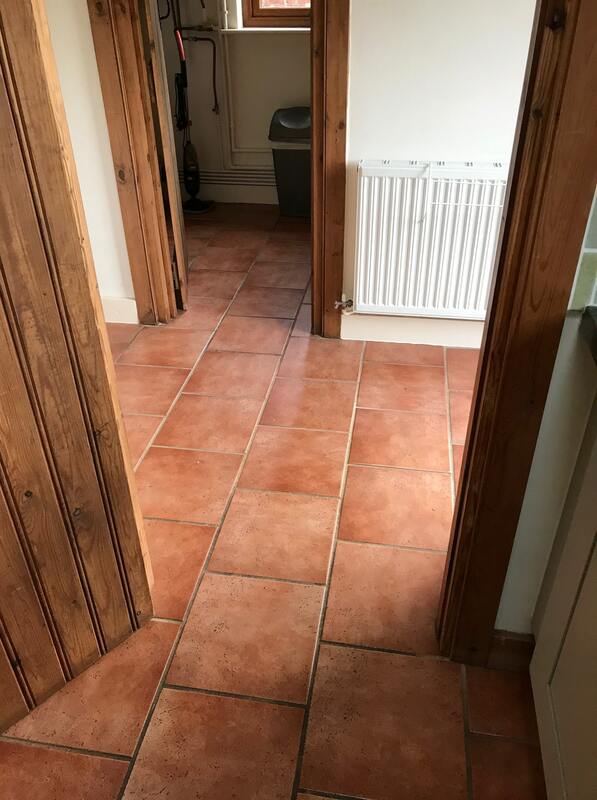 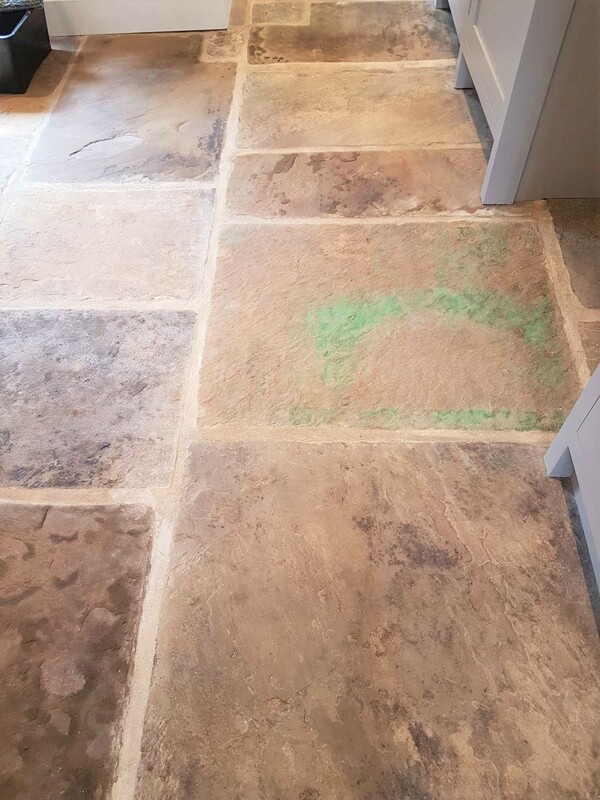 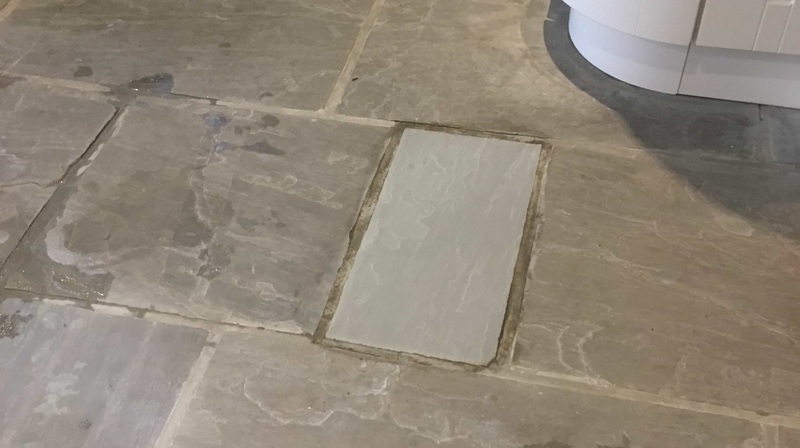 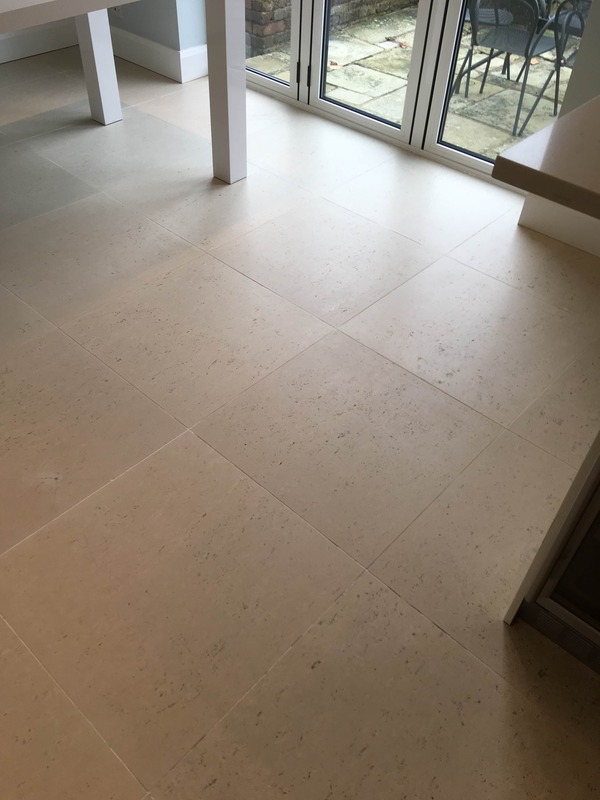 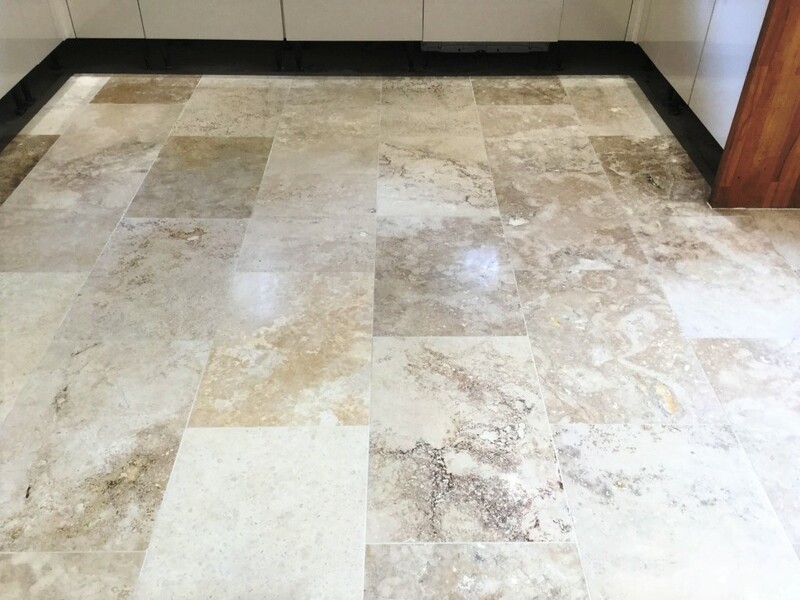 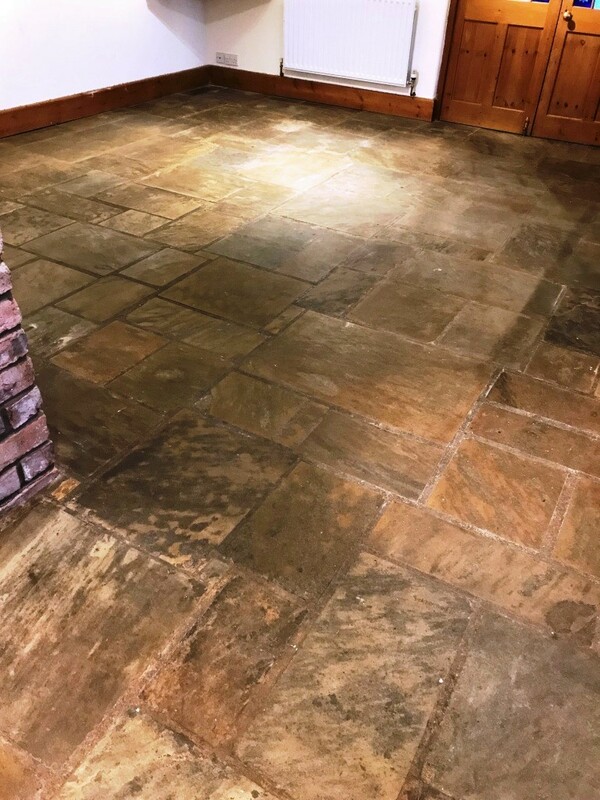 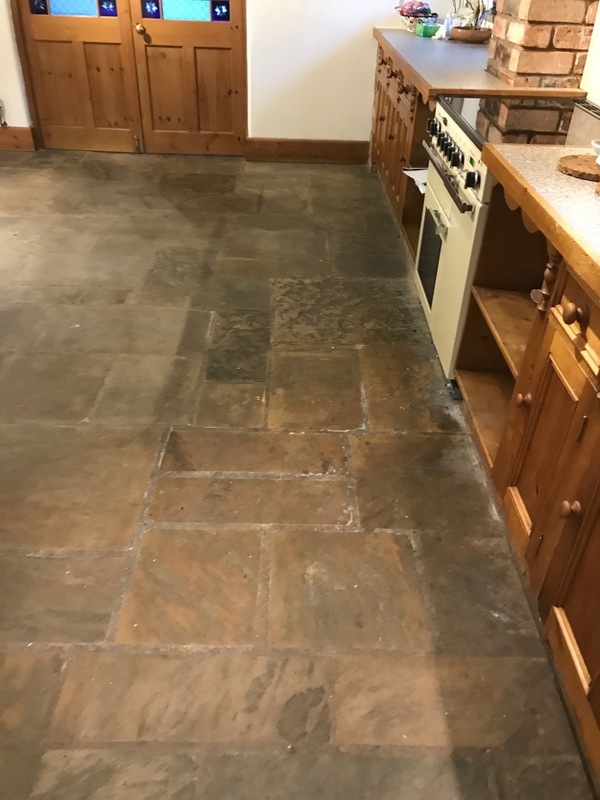 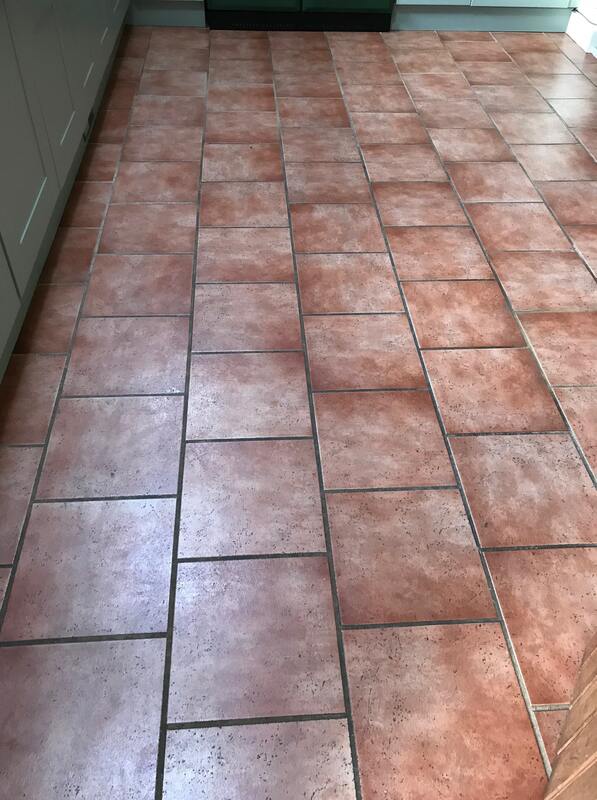 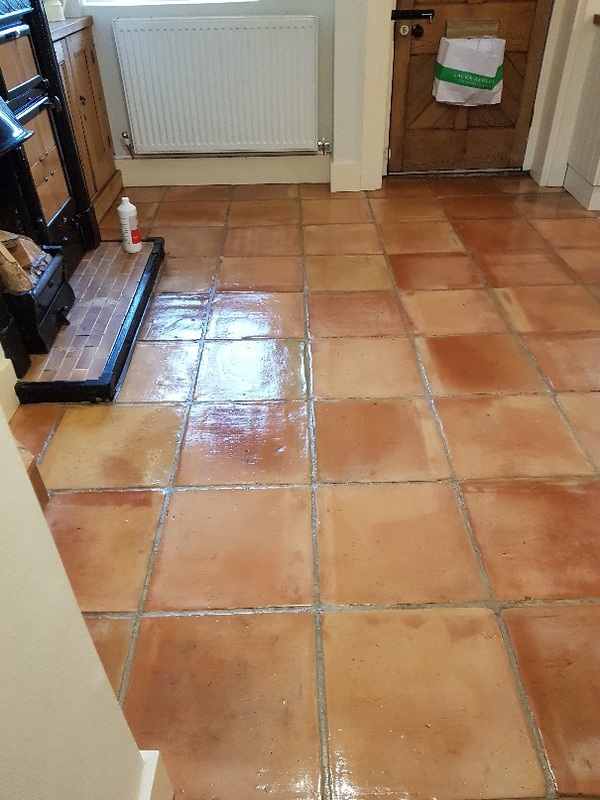 This dirty Travertine tiled kitchen floor was installed at a house in the village of Shepperton in the borough of Spelthorne and most famous for the TV studios nearby. 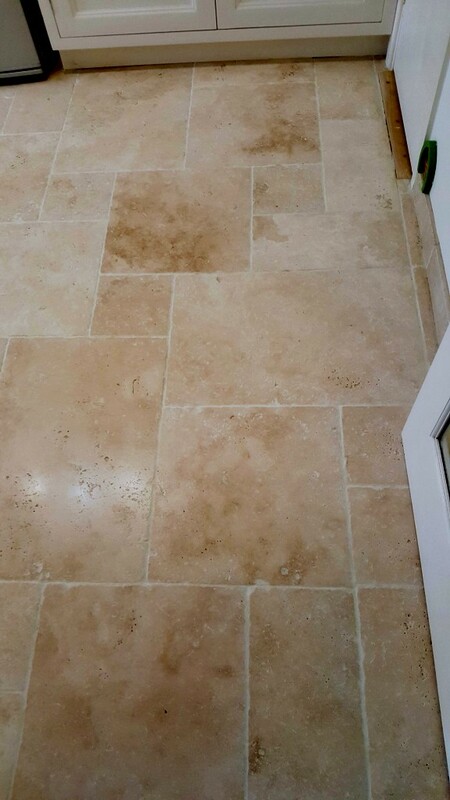 The Travertine tile had not been deep cleaned and sealed since installation, eight years prior and if you have been following my blog you will have probably guessed correctly that the protective sealer had worn off and dirt was now becoming trapped in the pores of the stone making it difficult to clean effectively. 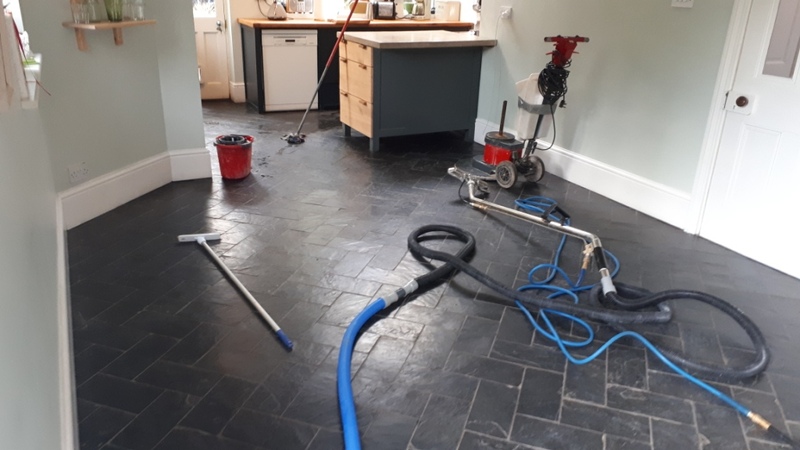 The customer asked us to visit and discuss what their options were, they had been trying to clean and maintain the floor using every day household products. 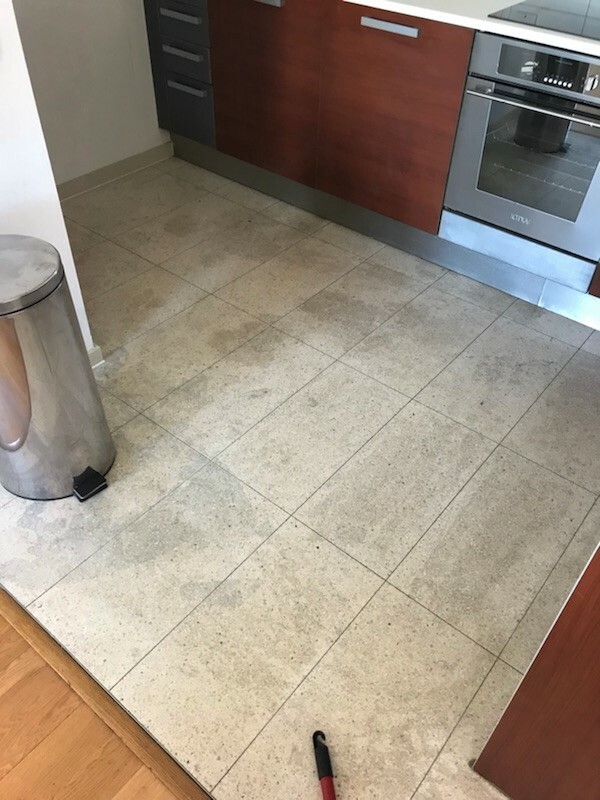 It just wouldn’t clean up and they felt it just looked dirty all the time. 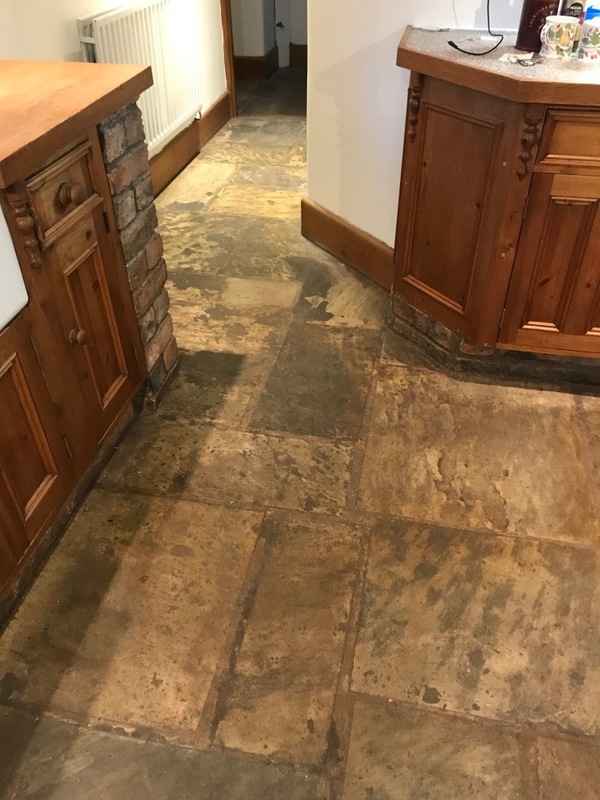 Sealers rarely last eight years on a stone floor and in this case the use of strong supermarket cleaning products had probably accelerated its demise. 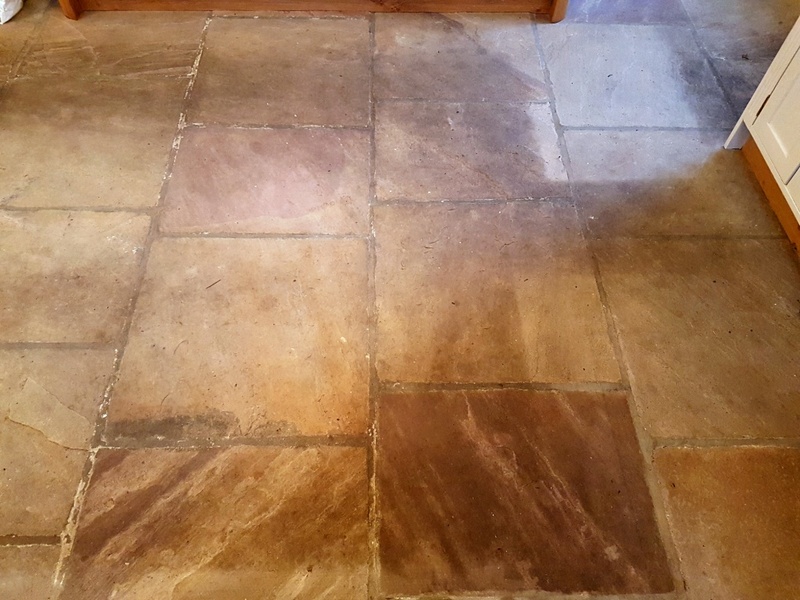 As you can see from the pictures the dirt and cooking grease had penetrated the stone and made it look really dirty. 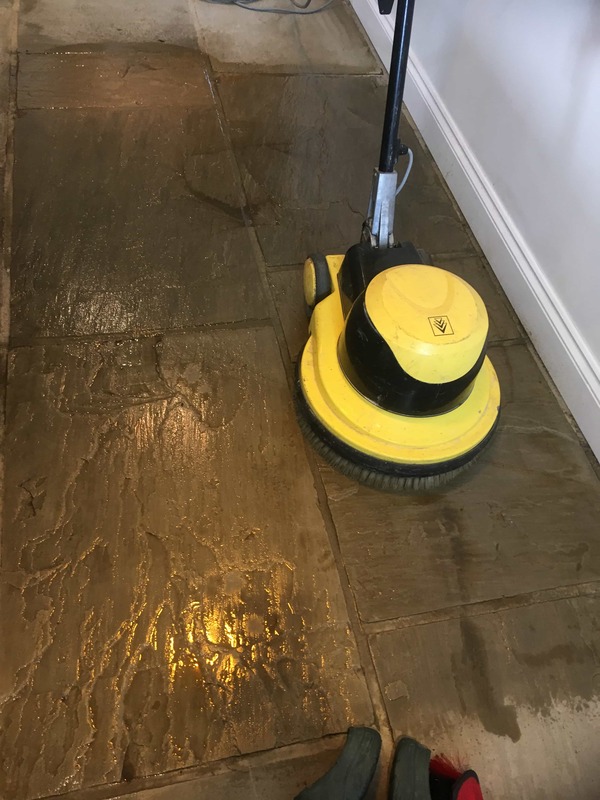 I talked them through the process and what could be done and completed a small cleaning demonstration which worked well. 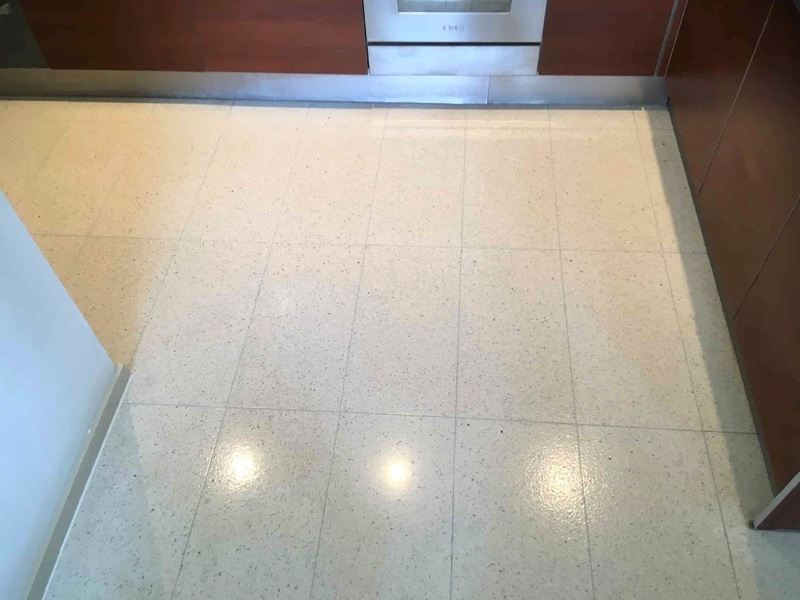 We agreed a price for the work and a mutually convenient date to complete the work for them, it would take two days. 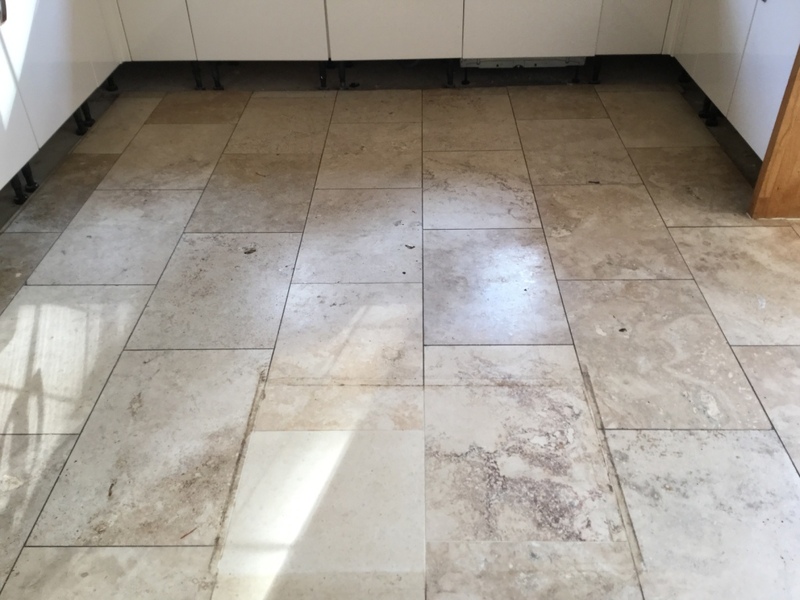 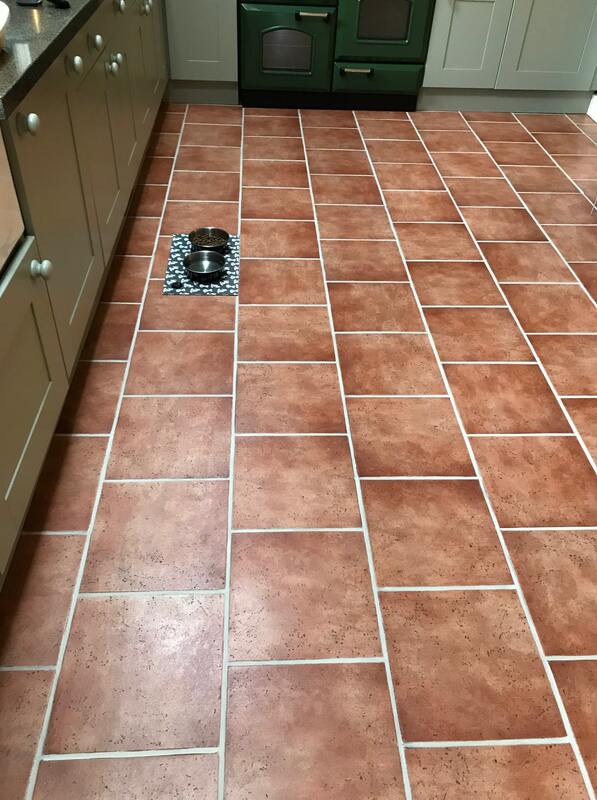 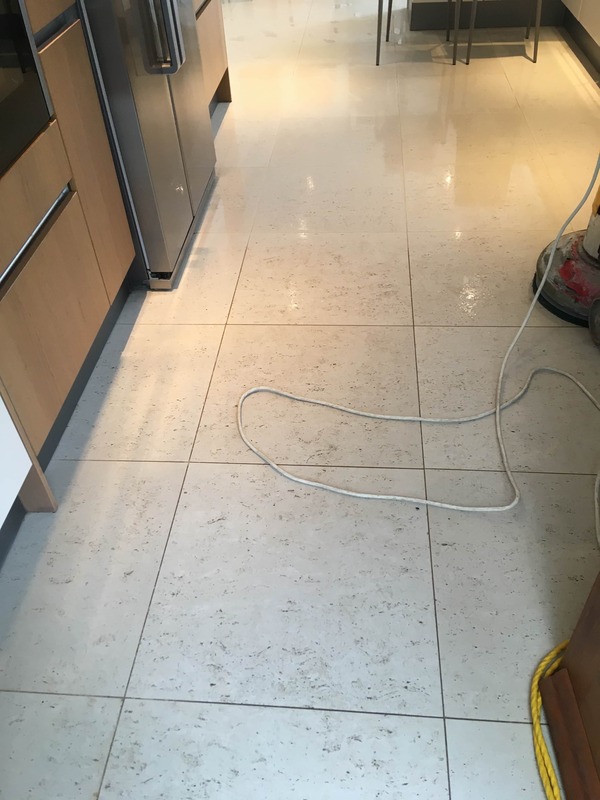 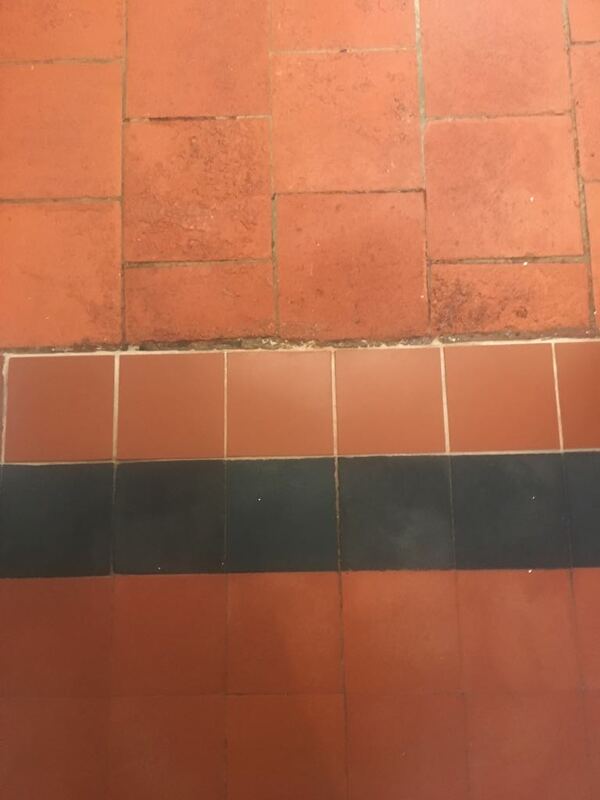 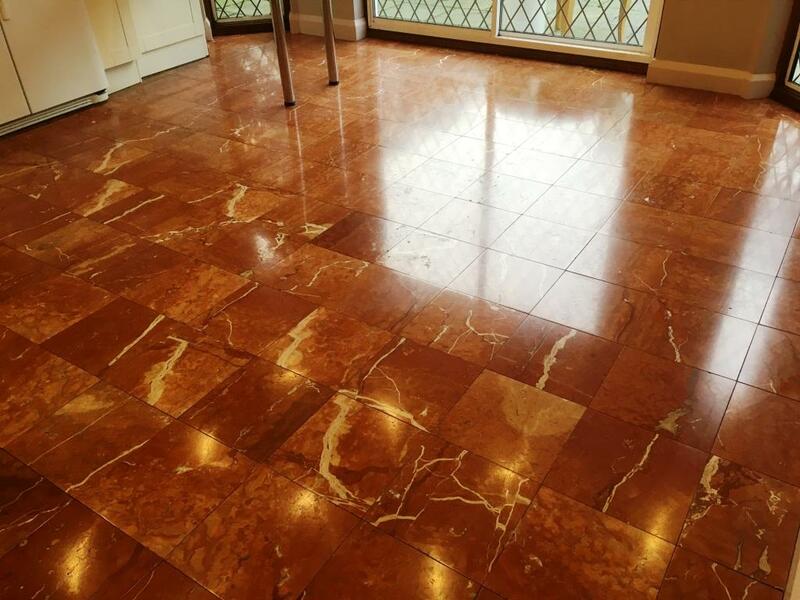 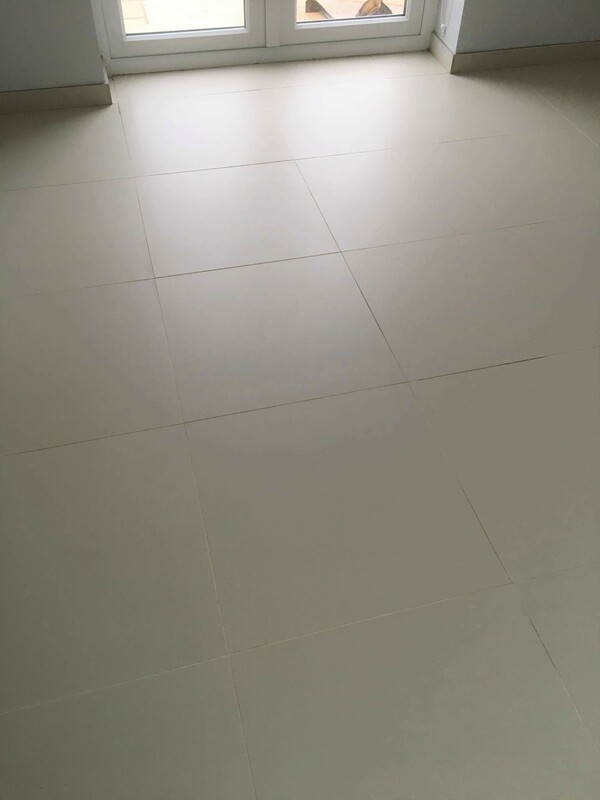 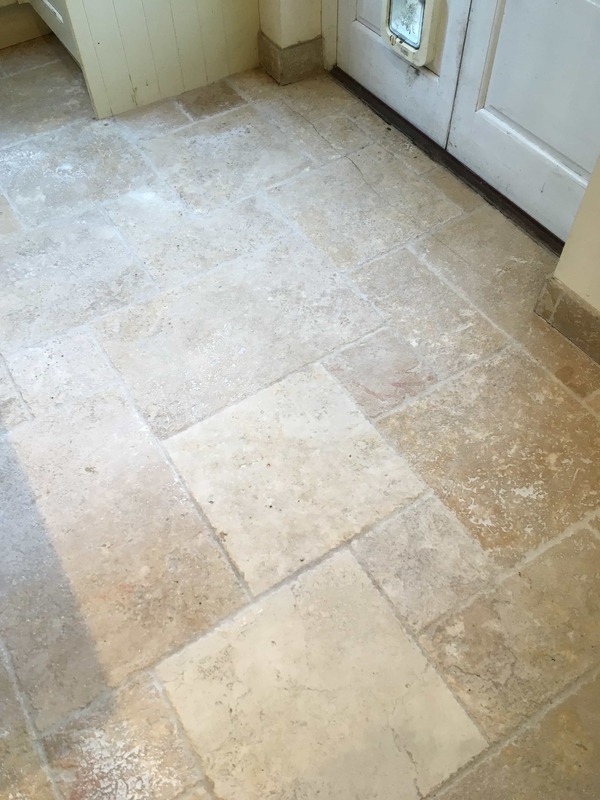 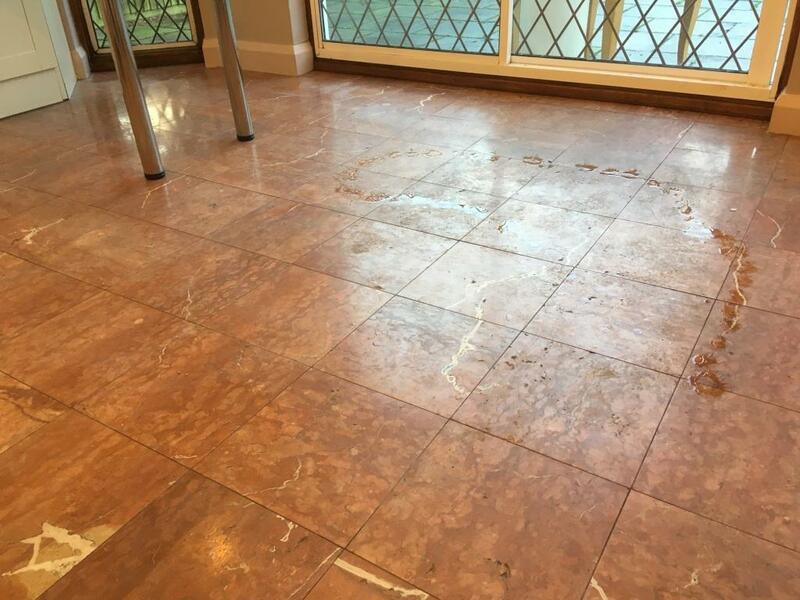 I returned on the agreed date and started by cleaning process by pre-spraying the Travertine tile and grout with a strong dilution of Tile Doctor Remove and Go. 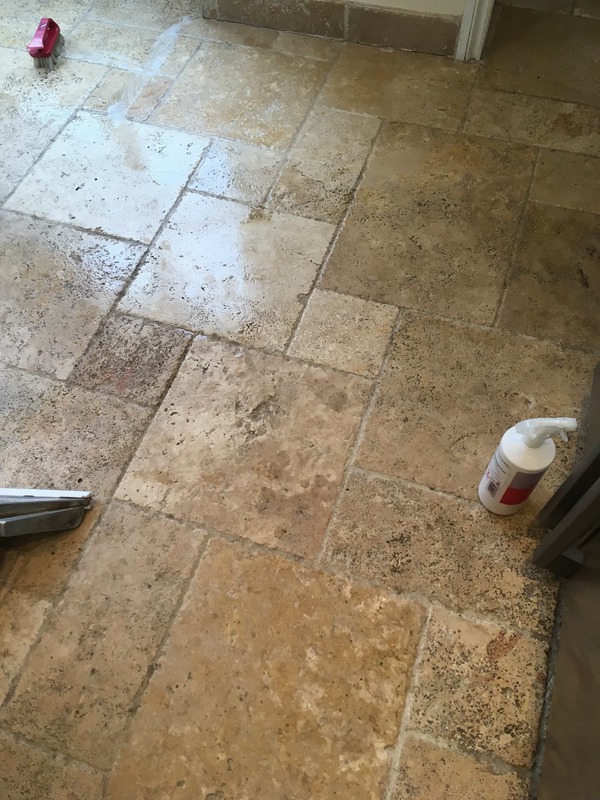 This product is a multi-purpose stripper formulated to remove most sealers and coatings from Tile and Stone. 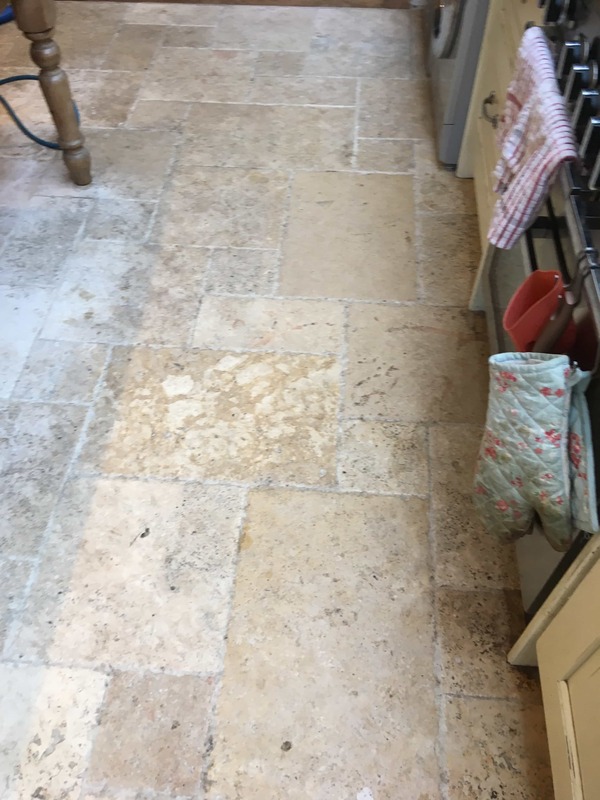 It works best when left to dwell for ten minutes before being scrubbed in and in this instance my aim was to break down the cooking greases and any remaining sealant that was left in the stone. 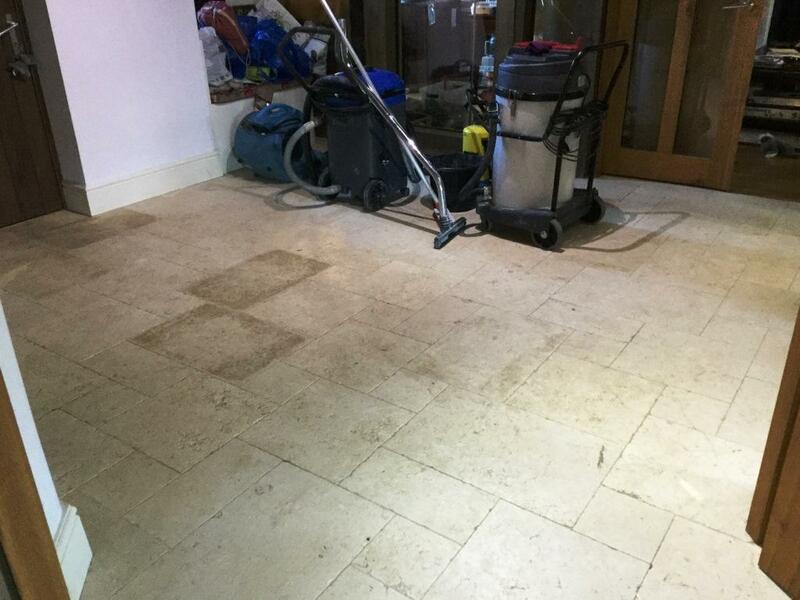 To scrub the solution into the floor I used a black scrubbing pad fitted to a rotary floor machine. 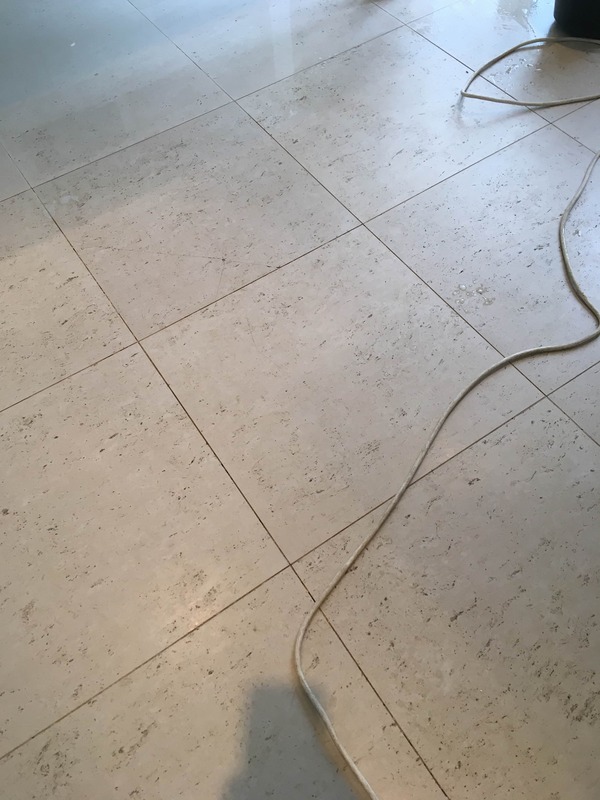 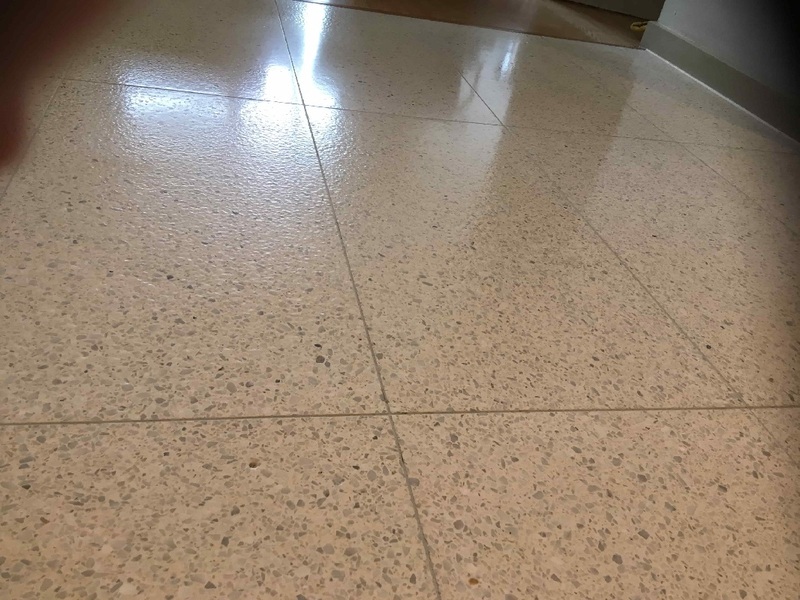 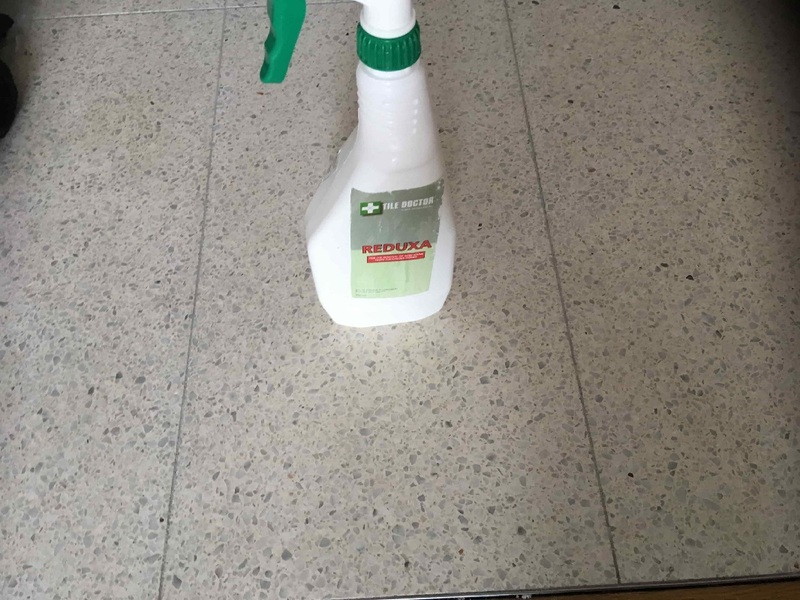 To the floor pads can struggle to reach into the recesses of the grout so for that I apply a strong dilution of Tile Doctor Pro-Clean and manually scrub it into the grout lines using a stiff grout brush. 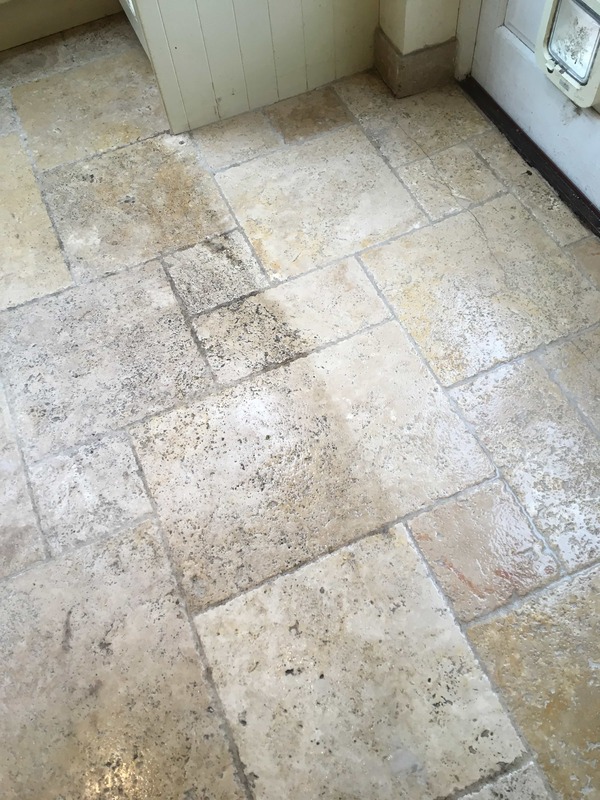 This alkaline chemical gives a deeper clean, getting to the deep-rooted dirt, it breaks it all down and leaves just the soil ready to be rinsed away. 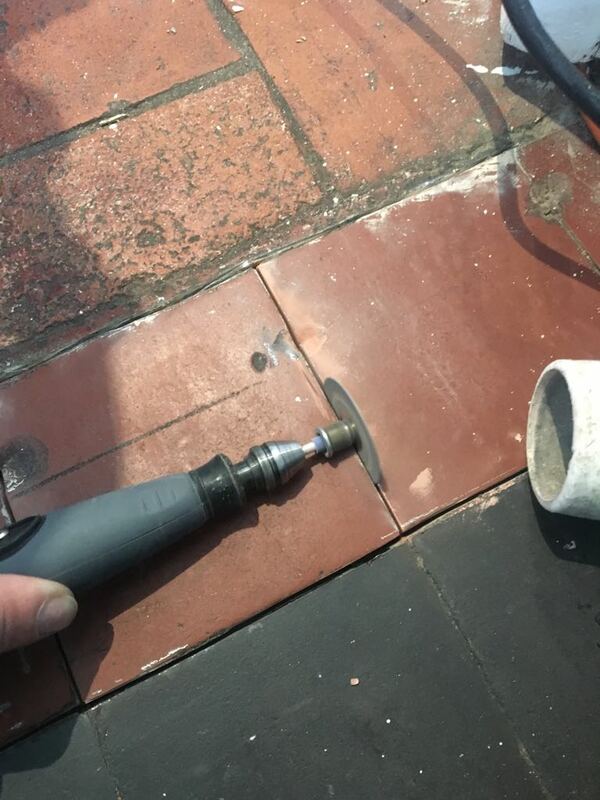 To remove the soil created by the cleaning process I use a spinner tool operating at low pressure. 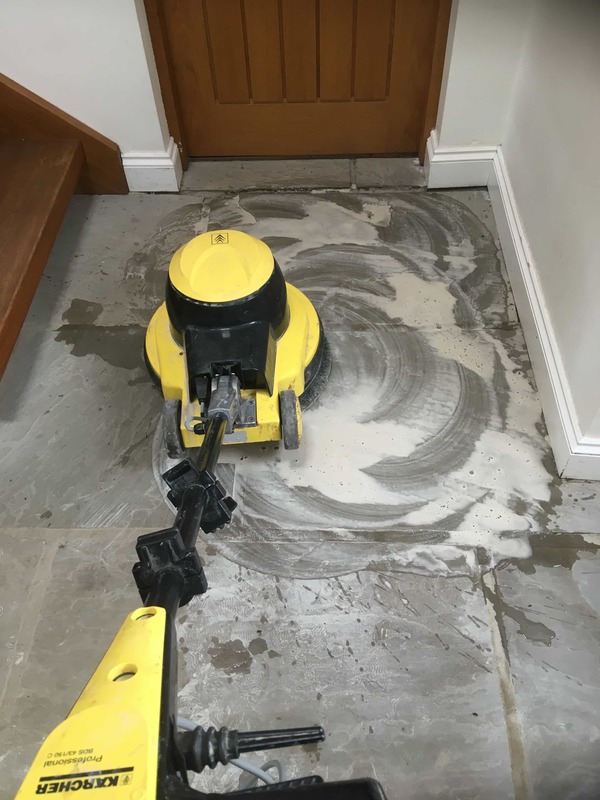 This is a clever piece of machinery that forces hot water onto the floor whilst simultaneously removing it along with the residue using a vacuum. 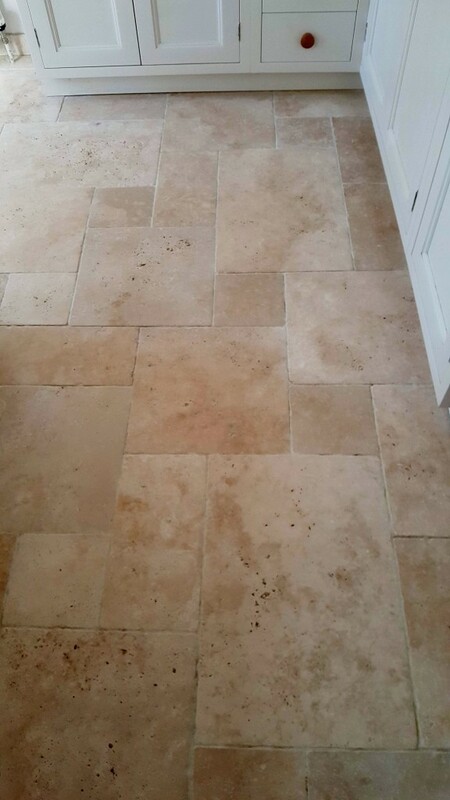 It leaves the floor clean of the dirt released from the pores of the stone during the cleaning process and relatively dry. 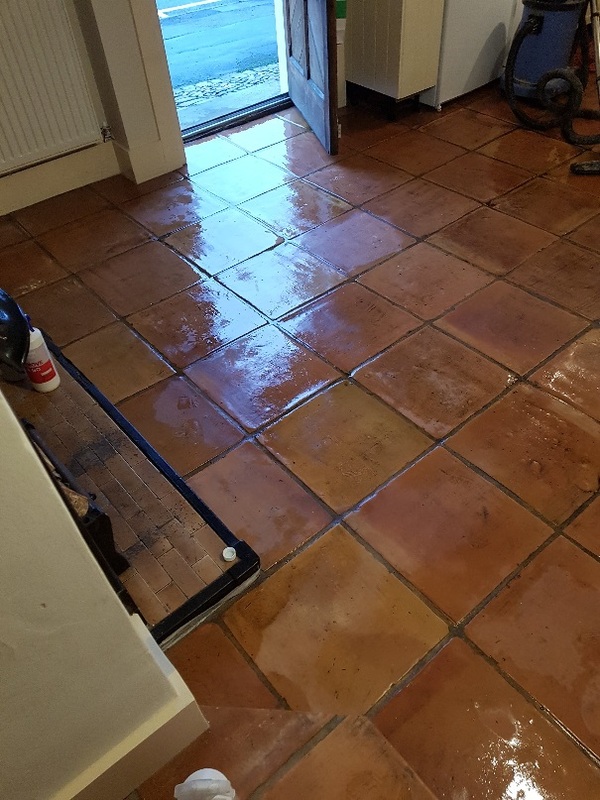 The floor needs to be dry before sealing so it was left to dry off fully overnight. 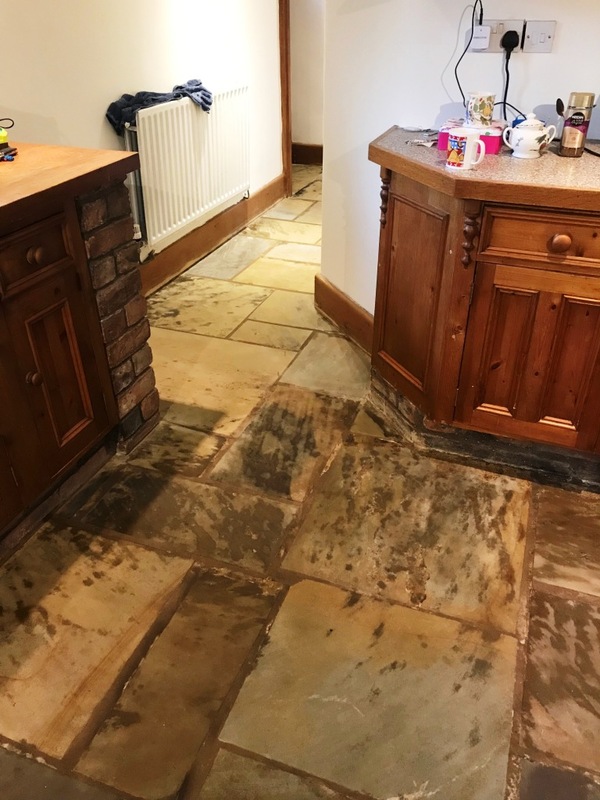 The next day I tested the floor with a damp meter to ensure it was dry and the results confirmed we were able to proceed. 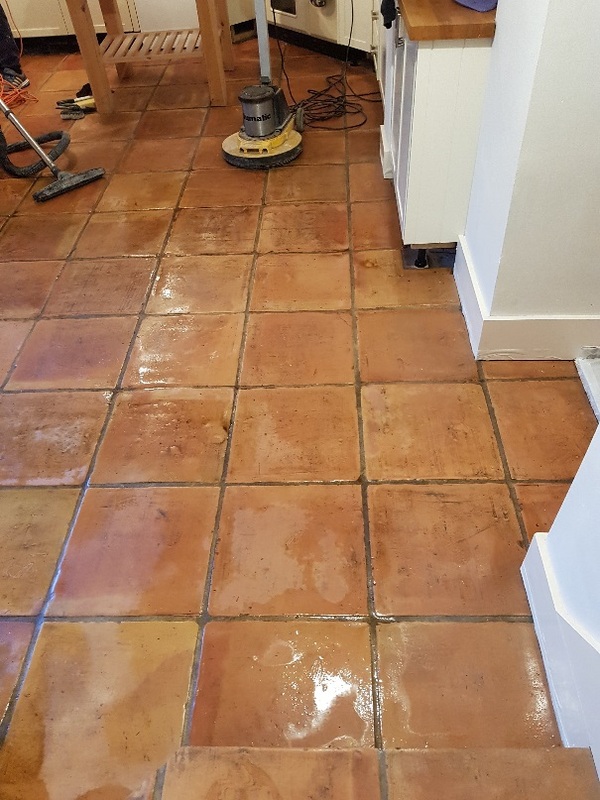 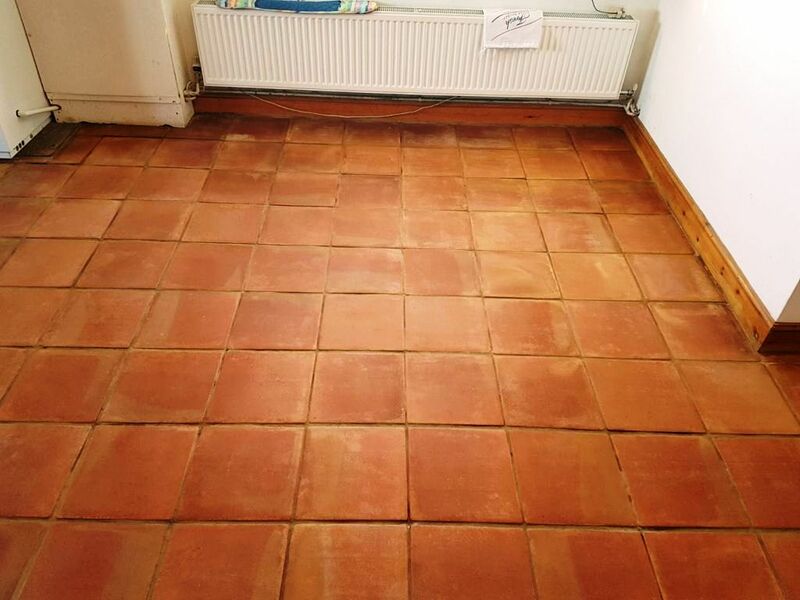 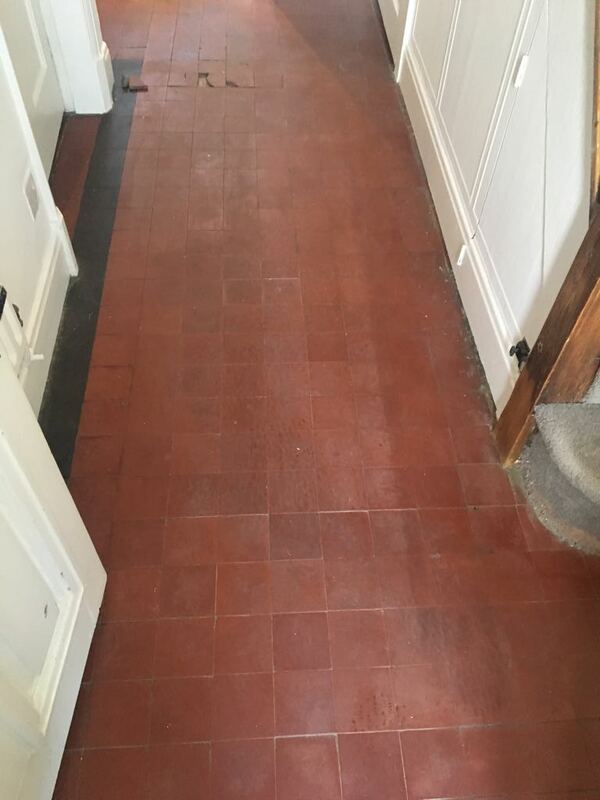 To seal the floor two coats of Tile Doctor Colour Grow were applied allowing the first coat to dry before applying the second. 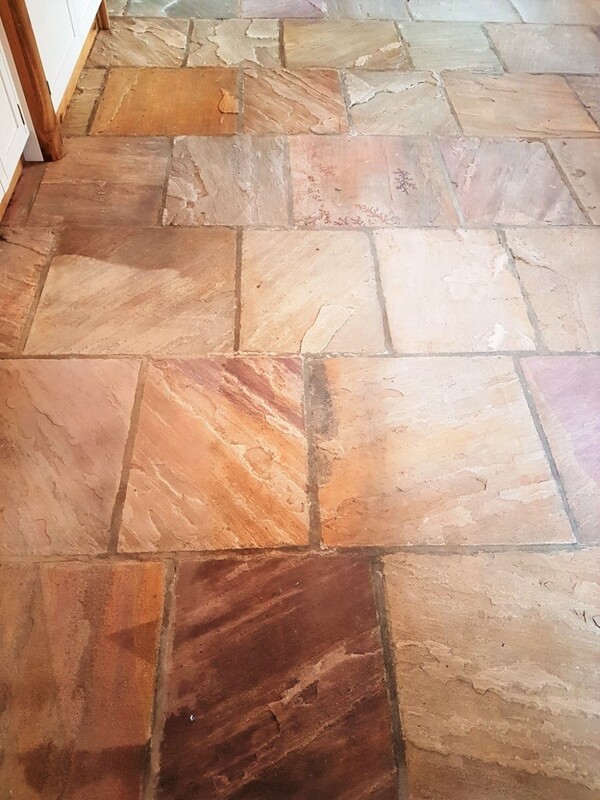 This product is an impregnator that seeps into the pores of the stone occupying the pores and protecting the floor from within. 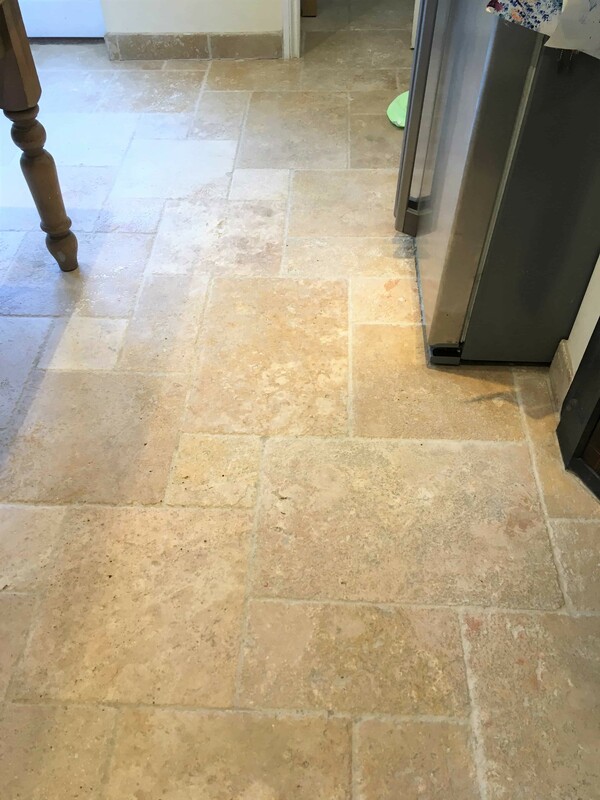 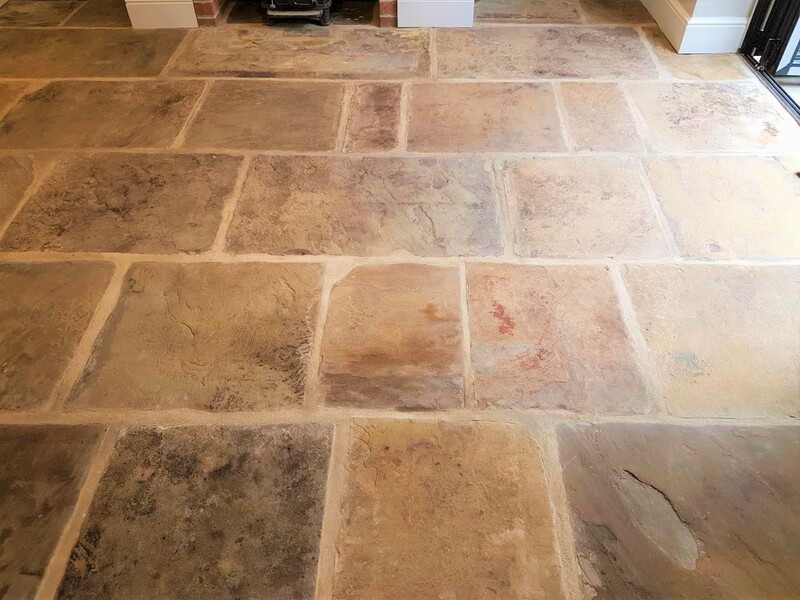 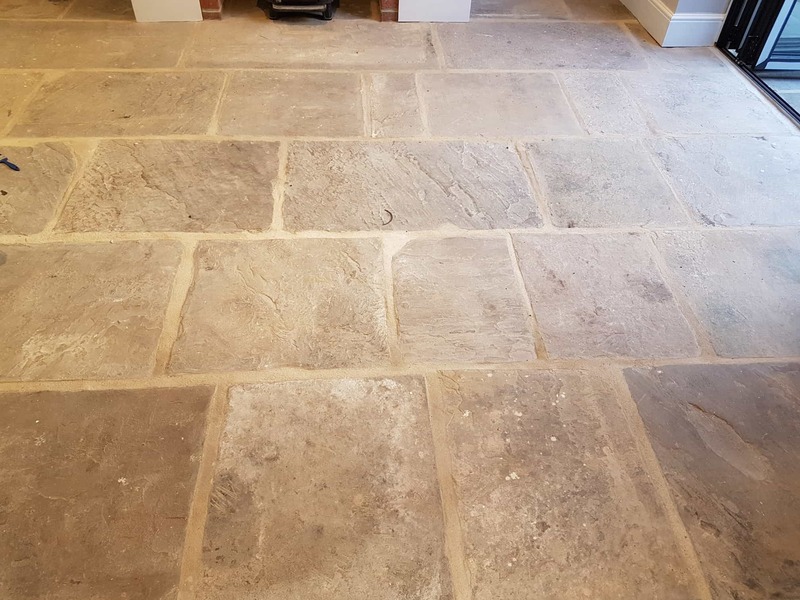 As well as protecting the Travertine from stains from spillages and day to day soiling this product also enhances the natural brown colours in the Travertine improving its appearance. 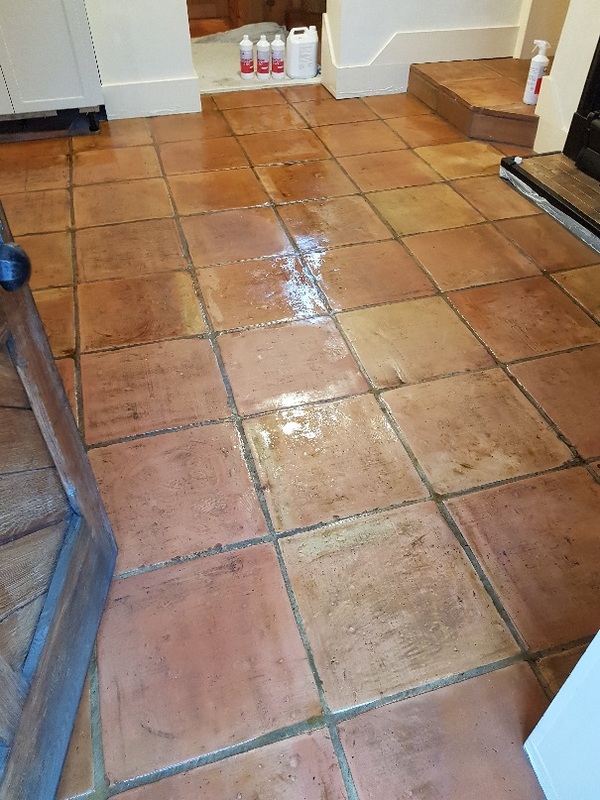 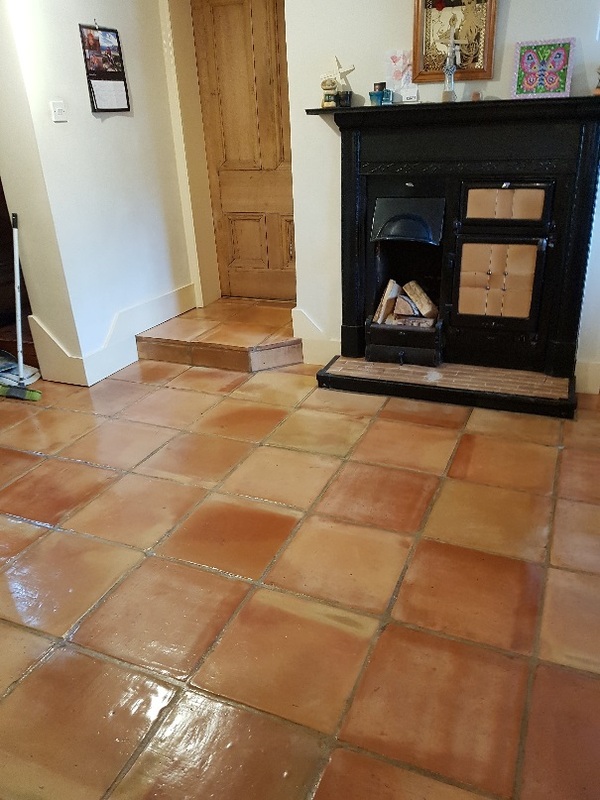 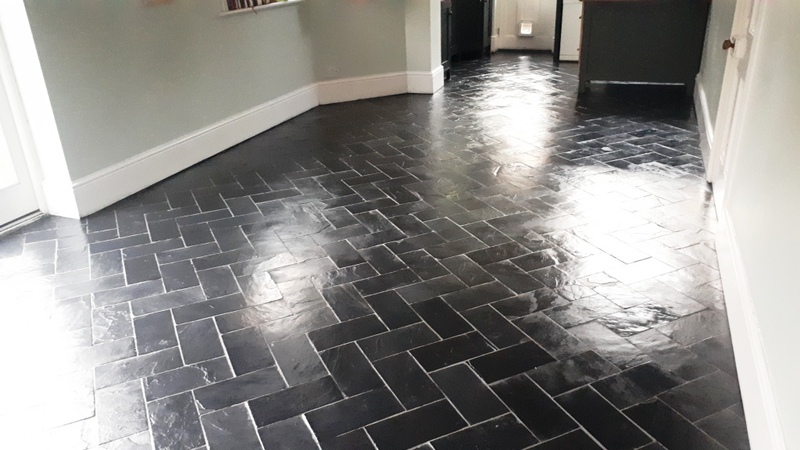 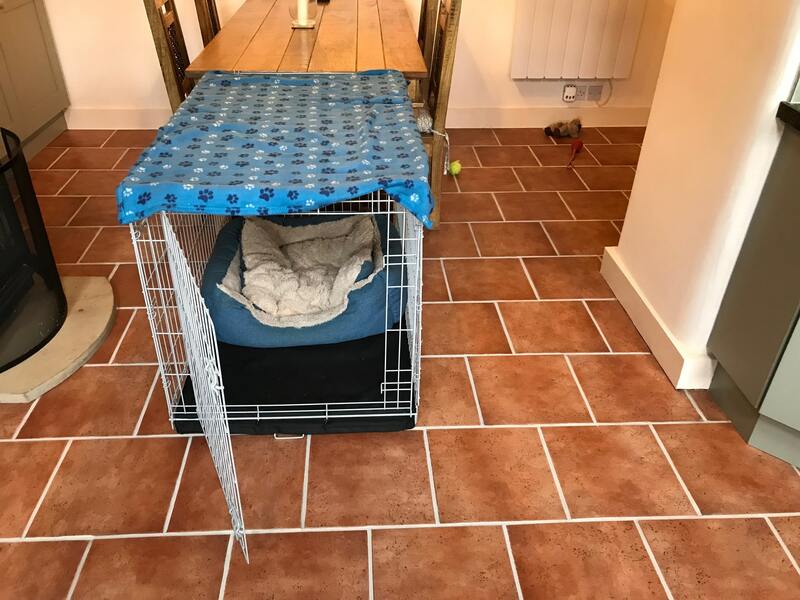 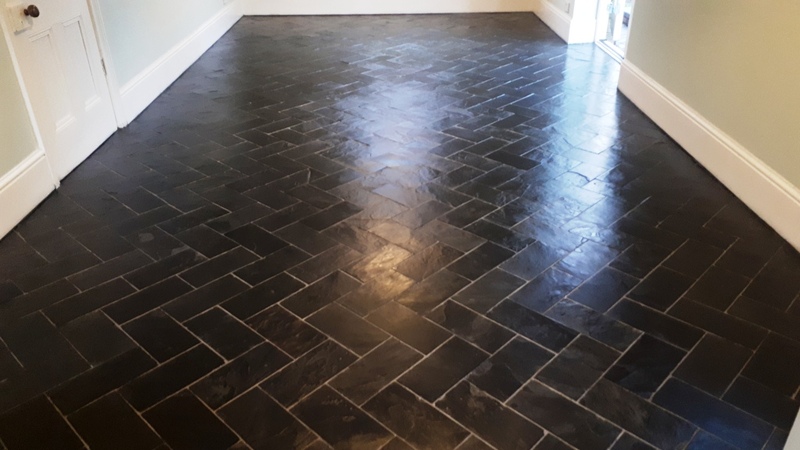 Once the second coat had dried the floor looked much cleaner and fresher and the client was over the moon with the results. 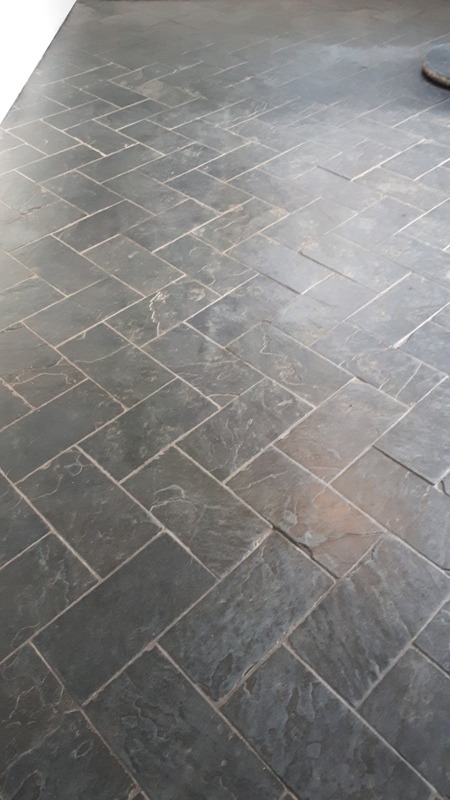 We discussed aftercare and I suggested they use Tile Doctor Neutral Tile Cleaner, it’s a pH neutral formula that will not prematurely degrade the sealer maximising the length of protection that it gives. 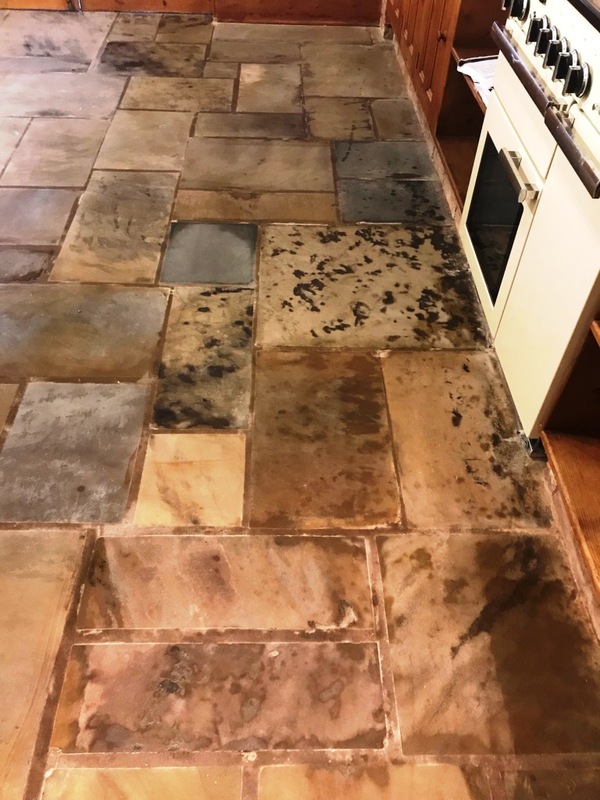 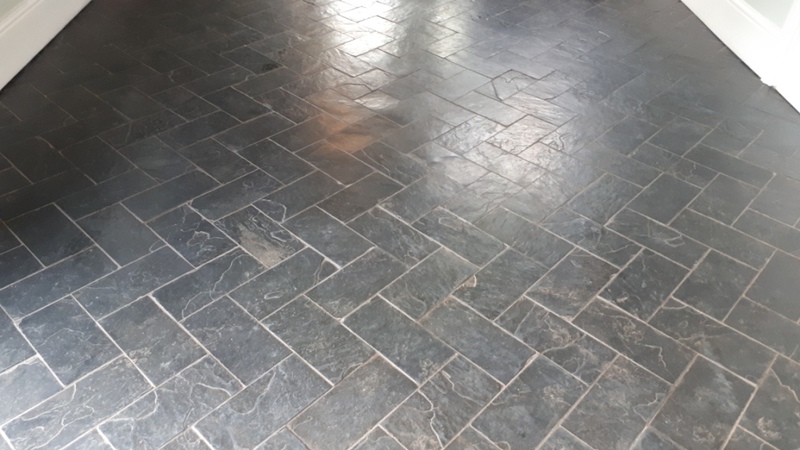 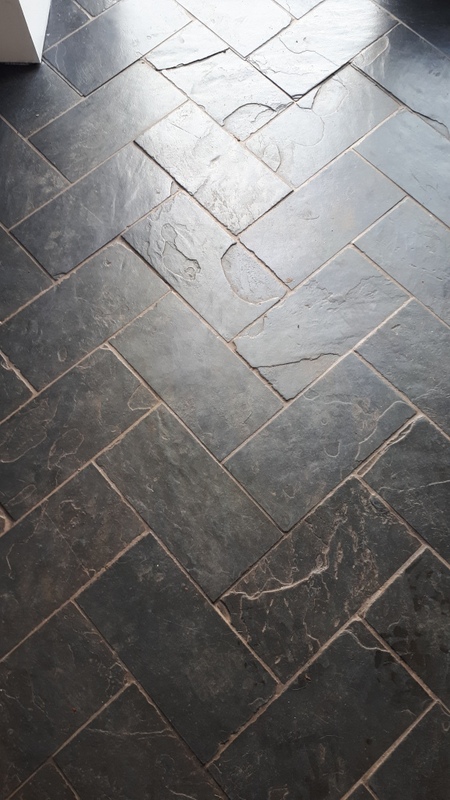 If they were to continue using the household cleaners many of which are acid based, they would find the newly applied sealer is slowly stripped off the floor leaving the stone unprotected and they will be back to square one.